본 발명은 이동통신시스템에서 멀티캐스트 멀티미디어 방송 서비스를 제공하는 방법에 관한 것이다. The present invention relates to a method for providing a multimedia broadcast multicast service in a mobile communication system. 본 발명에서는 무선망 제어부가 MBMS 무선 베어러 설정을 위한 제어 메시지들을 주기적으로 단말들에게 전송함으로써 해당 MBMS 서비스를 요청한 단말은 주기적으로 전송되는 제어 메시지에 의해 자신이 원하는 MBMS 서비스를 제공받기 위한 MBMS 무선 베어러를 설정할 수 있도록 하였다. MBMS RB in the present invention, for receiving the radio network controller is MBMS radio by sending control messages for bearer setup to periodically terminal UE that requested the corresponding MBMS service is periodically MBMS service he wants by the control messages sent to the which was to be set up. 또한 본 발명에서는 셀 별로 현재 제공되고 있는 MBMS 서비스들의 정보를 주기적으로 제공함으로써 단말이 자신이 요청한 MBMS 서비스의 제공 여부를 판단하고, 상기 판단 결과에 의해 개별 시그널링을 통해 무선망 제어부로 MBMS 무선 베어러를 설정하기 위한 정보를 요구할 수 있도록 하였다. In addition, the MBMS radio bearer to the radio network controller in the present invention, by providing the information of MBMS services currently provided by each cell periodically terminal through separate signaling by the determination result, and determine the availability of the MBMS services they request so we can ask for information to set up. 도 1은 이동통신시스템에서 멀티캐스트 멀티미디어 방송 서비스를 제공하기 위한 네트워크 구조를 개략적으로 도시한 도면. 1 is a block diagram illustrating a network structure for providing multimedia broadcast multicast service in a mobile communication system. 도 2는 이동통신시스템에서 멀티캐스트 멀티미디어 방송 서비스를 제공하기 위한 과정을 도시한 신호 흐름도. 2 is a flow diagram illustrating a signal process for providing a multimedia broadcast multicast service in a mobile communication system. 도 3은 도 2에서 203단계 내지 206단계의 상세 신호 흐름도. 3 is a step in the 2203 to detailed signal flow diagram of step 206. 도 4는 도 3에서 307단계와 308단계의 상세 신호 흐름도. 4 is a detailed signal flow diagram of step 307 and step 308 in FIG. 도 5는 본 발명의 제1실시 예에 따른 멀티캐스트 멀티미디어 방송 서비스를 제공하기 위한 무선 베어러 설정과정을 보이고 있는 신호 흐름도. Figure 5 is a flow chart showing signals in the radio bearer setup procedure for providing a multimedia broadcast multicast service according to the first embodiment of the present invention. 도 6은 본 발명의 제1실시 예에 따른 사용자 단말기의 동작을 도시한 제어 흐름도. Figure 6 is illustrating an operation of a user terminal according to the first embodiment of the present invention controls the flow chart. 도 7은 본 발명의 제1실시 예에 따른 무선망 제어부의 동작을 도시한 제어 흐름도. Figure 7 is showing the operation of the radio network controller according to the first embodiment of the present invention controls the flow chart. 도 8은 본 발명의 제2실시 예에 따른 멀티캐스트 멀티미디어 방송 서비스를 제공하기 위한 무선 베어러 설정과정을 보이고 있는 신호 흐름도. Figure 8 is a flow chart showing a signal in the second embodiment, a multicast radio bearer setup procedure for providing a multimedia broadcasting service in accordance with the present invention. 도 10은 본 발명의 실시 예에 따른 멀티캐스트 멀티미디어 방송 서비스 상태 CBS 메시지의 구조를 도시한 도면. Figure 10 is a view showing a structure of a multicast broadcast multimedia service state CBS message in an embodiment of the present invention. 도 11은 본 발명의 실시 예에 따른 공통전송채널의 전송 예를 보이고 있는 도면. 11 is a diagram illustrating a transmission example of a common transport channel according to an embodiment of the invention. 도 12는 본 발명의 제2실시 예에 따른 사용자 단말기의 동작을 도시한 제어 흐름도. 12 is a control flow chart showing the operation of the user terminal according to the second embodiment of the present invention. 도 13은 본 발명의 제2실시 예에 따른 무선망 제어부의 동작을 도시한 제어 흐름도. 13 is illustrating an operation of the radio network controller according to a second embodiment of the present invention controls the flow chart. 본 발명은 이동통신시스템에서 멀티캐스트 멀티미디어 방송 서비스를 제공하는 방법에 관한 것으로서, 특히 멀티캐스트 멀티미디어 방송 서비스를 제공하는 이동통신시스템에서 무선 네트워크 제어기와 사용자 단말기간 제어 메시지를 송/수신하는 방법에 관한 것이다. The invention in a mobile communication system a multicast relates to a method for providing a multimedia broadcast service, in particular the multicast in a mobile communication system providing a multimedia broadcast service radio network controller and a method for transmitting / receiving a user terminal-period control message will be. 오늘날 통신산업의 발달로 인해 부호 분할 다중 접속(CDMA: Code Division Multiple Access, 이하 "CDMA"라 칭하기로 한다) 이동 통신 시스템에서 제공하는 서비스는 음성 서비스뿐만이 아니라 패킷 데이터(packet data), 서킷 데이터(circuit data) 등과 같은 대용량의 데이터를 전송하는 멀티캐스팅 멀티미디어 통신으로 발전해 나가고 있다. Today, with the development of communication industry code division multiple access (CDMA: Code Division Multiple Access, hereinafter "CDMA" La referred as to) movement provided by the communication system service is a packet data (packet data), circuit data as well as voice services ( It is evolving into multicasting multimedia communication to transfer large amounts of data such as circuit data). 따라서, 상기 멀티캐스팅 멀티미디어 통신을 지원하기 위기 위해 하나의 데이터 소스에서 다수의 사용자 단말기(User Equipment, 이하 "UE"라 칭하기로 한다)들로 서비스를 제공하는 방송/멀티캐스트 서비스(Broadcast/Multicast Service)의 개발이 활발하게 이루어지고 있다. Thus, the multicasting to support multimedia communication crisis plurality of user terminals from a data source to (User Equipment, hereinafter "UE" referred to as referred), the broadcast / multicast service (Broadcast / Multicast Service provided by the service, ) it has been actively conducted development. 상기 방송/멀티캐스트 서비스는 메시지 위주의 서비스인 셀 방송 서비스(Cell Broadcast Service, 이하 "CBS"라 칭하기로 한다)와 실시간 영상 및 음성, 정지 영상, 문자 등 멀티미디어 형태를 지원하는 멀티캐스트 멀티미디어 방송 서비스(MBMS: Multimedia Broadcast/Multicast Service, 이하 "MBMS"라 칭하기로 한다)로 구분할 수 있다. The broadcast / multicast service is a cell broadcast service oriented message service (Cell Broadcast Service, and as a "CBS" La referred) and the real-time image and voice, still image, text, etc. multicast multimedia broadcast services that support multimedia form can be classified into: (it will be referred to as Multimedia Broadcast / Multicast Service, hereinafter "MBMS" MBMS). 그러면 여기서 이동 통신 시스템에서 상기 MBMS 서비스를 제공하기 위한 네트워크(network) 구조를 도 1을 참조하여 설명하기로 한다. Hereinafter, with reference to Figure 1 the network (network) structure for providing the MBMS service in a mobile communication system will be described. 상기 도 1은 이동 통신 시스템에서 MBMS 서비스를 제공하기 위한 네트워크 구조를 개략적으로 도시한 도면이다. FIG 1 is a diagram illustrating a network architecture for providing an MBMS service in a mobile communication system. 상기 도 1을 참조하면, 먼저 멀티캐스트/방송-서비스 센터(MB-SC: Multicast/Broadcast- Service Center, 이하 "MB-SC"라 칭하기로 한다)(110)는 MBMS 스트림(stream)을 제공하는 소스(source)이며, 상기 MB-SC(110)는 MBMS 서비스에 대한 스트림을 스케줄링(scheduling)하여 전송 네트워크(transit N/W)(120)로 전달한다. 1, a first multicast / broadcast-service center (MB-SC: it is referred to as a Multicast / Broadcast- Service Center, hereinafter "MB-SC") (110) is provided by the MBMS stream (stream) a source (source), the MB-SC (110) by scheduling (scheduling) the stream for the MBMS service is transmitted to the transmission network (transit N / W) (120). 상기 전송 네트워크(120)는 상기 MB-SC(110)와 서비스 패킷 무선 서비스 지원 노드(SGSN: Serving GPRS Support Node, 이하 "SGSN"이라 칭하기로 한다)(130) 사이에 존재하는 네트워크(network)를 의미하며, 상기 MB-SC(110)로부터 전달받은 MBMS 서비스에 대한 스트림을 상기 SGSN(130)으로 전달한다. The network (network) that exists between: (will be referred to as a Serving GPRS Support Node, hereinafter "SGSN" SGSN) (130) said transport network 120 is the MB-SC (110) and the service packet radio service support node, It means, and delivers a stream for the MBMS service received from the MB-SC (110) to the SGSN (130). 여기서, 상기 SGSN(130)은 게이트웨이 패킷 무선 서비스 지원 노드(GGSN: Gateway GPRS Support Node, 이하 "GGSN"이라 칭하기로 한다)와 외부 네트워크 등으로 구성 가능하고, 임의의 시점에서 상기 MBMS 서비스를 수신하고자 하는 다수의 UE들, 일 예로 기지국1(Node B1), 즉 셀1(cell 1)(160)에 속하는 UE1(161), UE2(162), UE3(163)과, 기지국2, 즉 셀2(170)에 속하는 UE4(171), UE5(172)가 존재하고 있다고 가정하기로 한다. Here, the SGSN (130) is a gateway packet radio service support node composed of (GGSN Gateway GPRS Support Node, hereinafter, will be referred to as a "GGSN") and an external network such as possible, and to receive the MBMS service at a particular time a plurality of UE to, for example the base station 1 (Node B1), i.e. the UE1 (161), UE2 (162), UE3 (163) belonging to the cell 1 (cell 1) (160), the base station 2, that is, cell 2 ( UE4 (171) belonging to 170), it is assumed that it is UE5 (172) exists. 상기 전송 네트워크(120)에서 MBMS 서비스에 대한 스트림을 전달받은 SGSN(130)은 MBMS 서비스를 받고자 하는 가입자들, 즉 UE들의 MBMS 관련 서비스를 제어하는 역할, 일 예로 가입자들 각각의 MBMS 서비스 과금 관련 데이터를 관리 및 MBMS 서비스 데이터를 특정 무선 네트워크 제어기(RNC: Radio Network Controller, 이하 "RNC"라 칭하기로 한다)(140)에게 선별적으로 전송하는 것과 같은 MBMS 관련 서비스를 제어한다. Subscribers that SGSN (130) that received the stream for the MBMS service in the transport network 120 may receive the MBMS service, that is, serve to control the MBMS-related service of the UE, For example a subscriber of each of MBMS service accounting-related data and it controls an MBMS-related service such as a (will be referred to as radio network controller, hereinafter "RNC" RNC) (140) as sending selectively administration and the MBMS service data to a particular RNC. 이하 설명의 편의상 상기 "기지국"을 "셀" 개념과 동일한 개념으로 사용하기로 한다. It will be used for convenience, the "base station" in the following description, the same concept as the "cell" concept. 상기 기지국은 한 개의 셀만을 관리할 수도 있고 다수의 셀들을 관리할 수도 있음은 물론이다. The base station is of course that can manage a plurality of cells, and also to manage only one cell. 또한 상기 SGSN(130)은 상기 RNC(140)로, 상기 RNC(140)는 해당 셀들로 선별적인 MBMS 데이터 전송을 수행해야하며, 이를 위해서 상기 SGSN(130)은 상기 MBMS 서비스를 받고 있는 RNC들의 명단을 알고 있어야만하며, 상기 RNC(140)는 상기 MBMS 서비스를 받고 있는 셀들의 명단을 알고 있어야만 한다. In addition to the SGSN (130) is the RNC (140), said RNC (140) is, and must perform the selective MBMS data transmission to the cells, the SGSN (130) to this, the list of RNC receiving the MBMS be aware of, and the RNC (140) should be aware of list of cells receiving the MBMS service. 그래야 이후에 상기 RNC(140)는 저장하고 있는 셀들로 MBMS 서비스를 제공하는 것이 가능하다. After so that the RNC (140) is able to provide the MBMS service to which the storage cells. 상기 RNC(140)는 다수의 셀들을 제어하며, 자신이 관리하고 있는 셀들중 MBMS 서비스를 요구하는 UE가 존재하는 셀로 MBMS 서비스 데이터를 전송하며, 또한 상기 MBMS 서비스를 제공하기 위해 설정되는 무선 채널(radio channel)을 제어하고, 또한 상기 SGSN(130)으로부터 전달받은 MBMS 서비스에 대한 스트림을 가지고 상기 MBMS 서비스에 관한 정보를 관리한다. The RNC (140) is controlling a plurality of cells, and transmits the cell MBMS service data to a UE requesting the MBMS service of the cells that they manage, present, also the radio channel established to provide the MBMS service ( control the radio channel) and also manages information about the MBMS service has a stream for the MBMS service received from the SGSN (130). 그리고 상기 도 1에 도시되어 있는 바와 같이 하나의 기지국, 일 예로 셀2(170)와 상기 셀2(170)에 속하는 UE들(171), (172)간에는 MBMS 서비스를 제공하기 위해 하나의 무선 채널만이 구성된다. And a radio channel for providing an MBMS service between a base station, one example UE to belong to the cell # 2 170 and the cell # 2 170, 171, 172. As shown in FIG. 1 only it is formed. 그리고 상기 도 1에 도시하지는 않았지만 홈위치 등록기(HLR: Home Location Register)는 상기 SGSN(130)과 연결되어, MBMS 서비스를 위한 가입자 인증을 수행한다. And although not shown in the Figure 1 a home location register (HLR: Home Location Register) it is connected to the SGSN (130), and performs subscriber authentication for an MBMS service. 그러면 여기서 임의의 MBMS 서비스를 제공하는 과정을 고려하면 다음과 같다. Hereinafter, considering the process of providing a particular MBMS service as follows. 임의의 MBMS 서비스를 제공하기 위해서는 먼저 상기 MBMS 서비스에 대한 기본 정보들이 UE들에게 전달되어야 하고, 상기 MBMS 서비스에 대한 기본 정보들을 수신한 UE들이 상기 임의의 MBMS 서비스를 제공받고자 할 경우 그 UE들 명단이 네트워크로 전달되어야 한다. In order to provide a particular MBMS service, first basic information for the MBMS service to be delivered to the UE, if the UE receiving the basic information for the MBMS service to be sought providing the particular MBMS service to the UE list, It shall be forwarded to the network. 이렇게 네트워크에서 상기 임의의 MBMS 서비스를 제공받기를 원하는 UE들 명단을 수신하면, 상기 네트워크는 상기 UE들을 호출(paging)하여 상기 MBMS 서비스를 제공하기 위한 무선 베어러(Radio Bearer)를 설정해야 한다. In this state, the network receives a list of the UE want to receive service for the MBMS service, the network must set up a radio bearer (Radio Bearer) for providing the MBMS service by calling (paging) of the UE. 이렇게 상기 UE들과 무선 베어러가 설정된 후, 상기 설정된 무선 베어러를 통해 상기 임의의 MBMS 서비스를 제공한다. This provides the UE and then the radio bearer is set, the particular MBMS service over the set radio bearer. 한편, 상기 MBMS 서비스가 종료되면 그 종료 사실이 모든 UE들에게 통보되어야만하고, 이에 따라 모든 UE들은 상기 MBMS 서비스를 위해 할당하였었던 모든 자원(resource)들을 해제(release)해야 정상적인 MBMS 서비스가 가능하다. On the other hand, if the MBMS service is ended the exit fact must be notified to every UE, and thus all the UE are in a normal MBMS service can be turned off (release) of all resources (resource) who were assigned for the MBMS service according . 도 2는 이동통신시스템에서 UE와 네트워크간 MBMS 서비스 제공을 위한 신호 흐름을 도시하고 있는 도면이다. 2 is a drawing illustrating a signal flow for an MBMS service between a UE and a network in a mobile communication system. 상기 도 2를 참조하면, UE는 임의의 MBMS 서비스를 제공받기 위해 코어 네트워크(CN: Core Network)로 사용자 등록(SUBSCRIPTION) 과정을 수행한다(201단계). Referring to FIG. 2, the UE provides the core network in order to receive a particular MBMS service, performs user registration (SUBSCRIPTION) to process (CN Core Network) (step 201). 여기서, 상기 코어 네트워크라 함은 상기 도 1에서 설명한 바와 같이 MB-SC와, 전송 네트워크와, SGSN을 포함한다. Here, it referred to as the core network includes an MB-SC, a transmit network, a SGSN as described above, FIG. 상기 사용자 등록 과정은 서비스 제공자(service provider)와 사용자간에 MBMS 서비스에 있어 과금 혹은 MBMS 서비스 수신에 관련된 기본적인 정보를 교환하는 과정이다. The user registration process is a process of exchanging basic information related to MBMS service accounting or MBMS service reception in between the service provider (service provider) and the user. 이렇게 사용자 등록이 완료되면, 상기 코어 네트워크는 현재 제공 가능한 MBMS 서비스들에 대한 기본적인 정보들, 일 예로 메뉴 정보(MENU INFORMATION)를 상기 MBMS 서비스 가입자들인 UE들에게 안내하기 위해 서비스 안내(ANNOUNCEMENT) 과정을 수행한다(202단계). This means that the user registration is completed, the core network is a basic information field As an example menu information (MENU INFORMATION) a service guide (ANNOUNCEMENT) the process for guiding to the UE which includes the MBMS service subscriber for currently available MBMS services performs (step 202). 여기서, 상기 메뉴 정보라 함은 특정 MBMS 서비스가 개시되는 시각 정보와 지속 시간 등을 나타내는 정보이다. Here, it referred to as the menu information is information indicating the particular MBMS service is being start time and duration. 상기 코어 네트워크는 상기 메뉴 정보를 미리 설정되어 있는 서비스 영역(service area)들(CBS 등과 같은 방송 서비스)을 통해 방송하거나 혹은 MBMS 서비스 요청이 있는 UE들에게만 전송할 수 있다. The core network can be transmitted only to the UE in a broadcast, or MBMS service request via the (broadcast service such as CBS) said menu information is a pre-set service area (service area). 그리고 상기 코어 네트워크는 상기 메뉴정보를 통하여 각 MBMS의 서비스를 차별화하여 구분하기 위한 MBMS 서비스 식별자(MBMS SERVICE ID)를 알려주게 된다. And the core network is known to give an MBMS service ID (MBMS SERVICE ID) for identifying each MBMS service to differentiate through the menu information. 상기 서비스 안내 과정을 통해 메뉴 정보를 통보 받은 UE들 각각은 상기 메 뉴 정보들 중 서비스 받고자하는 특정 MBMS 서비스를 선택하고, 상기 코어 네트워크로 상기 선택한 MBMS 서비스에 대한 서비스 요청(JOINING) 과정을 수행한다(203단계). UE each notified the menu information through the service guide process selects a specific MBMS service to receive the service of the menu information, and performs a service request (JOINING) process on the selected MBMS service, wherein in the core network (step 203). 여기서, 상기 UE가 상기 코어 네트워크로 전송하는 상기 서비스 요청 메시지는 상기 선택한 MBMS 서비스를 나타내는 MBMS 서비스 식별자와, 해당 UE를 나타내는 UE 식별자(UE ID)를 포함한다. Here, the request message to the service that the UE is sent to the core network includes a UE identifier (UE ID) indicating the MBMS service ID and the UE indicating the selected MBMS service. 상기 UE의 서비스 요청에 따라 상기 코어 네트워크는 UE가 서비스 받고자 하는 MBMS 서비스를 식별하게 되고, 상기 UE와의 멀티캐스트 모드 베어러 셋업(multicast mode bearer setup) 과정을 수행한다(204단계). Depending on the service request of the UE and the core network identifies the MBMS service the UE is to receive the service, the UE performs the multicast mode bearer setup (multicast mode bearer setup) with the process (step 204). 상기 멀티캐스트 모드 베어러 셋업 과정에서 상기 코어 네트워크, 즉 SGSN과 전송 네트워크 상에 상기 MBMS 서비스를 제공하기 위한 트랜스포트 베어러(transport bearer)가 미리 설정될 수 있다. In the multicast mode bearer setup process, the core network, i.e., the SGSN and the transmission transport bearer on the network for providing the MBMS service (bearer transport) may be set in advance. 일 예로, 상기 SGSN과 GGSN 사이에 상기 MBMS 서비스를 위한 GTP-U/UDP/IP/L2/L1 bearer(3GPP TS 23.060 참조)가 미리 설정될 수 도 있다. In one embodiment, (see 3GPP TS 23.060), the SGSN and the GTP-U / UDP / IP / L2 / L1 bearer for the MBMS service between the GGSN can also be pre-set. 그 후 상기 코어 네트워크는 상기 UE에 의해 요청된 MBMS 서비스가 곧 개시될 것임을 나타내는 일종의 호출(paging) 과정인 서비스 통지(NOTIFICATION) 과정을 수행한다(205단계). Then the core network performs a type of call (paging) process the service notification (NOTIFICATION) to indicate that the process is started immediately the MBMS service requested by the UE (step 205). 상기 205단계에서 이루어지는 호출 과정은 기존의 호출 방식이 사용되거나 동일 출원인에 의해 선 출원된 출원번호 P2002-34704에서 게시하고 있는 MBMS 서비스에 최적화된 호출 방식이 사용될 수 있다. Call process performed in step 205 is the called method optimized for an MBMS service that use the existing call in the system or published Application No. P2002-34704 filed by the same applicant line may be used. 상기 서비스 통지 과정을 통해 요청한 MBMS 서비스가 곧 개시될 것임을 감지한 UE는 상기 코어 네트워크와 무선 자원 할당(Radio resource allocation) 과정을 통해 상기 MBMS 서비스를 제공하기 위해 무선 자원을 실제 할당한다. UE MBMS service requested through the service notification process that detects that will start soon is the actual allocation of radio resources to provide the MBMS service via the core network and the radio resource allocation (resource allocation Radio) process. 그리고, 상기 할당한 무선 자원 관련 정보들을 실제 하드웨어적 구성으로 실현한다(206단계). Then, the realization of the allocated radio resource-related information with the actual hardware configuration (step 206). 여 기서, 상기 무선 자원 할당 과정은 상기 RNC가 임의의 셀에 위치한 UE들에게 해당 셀에서 상기 MBMS 서비스가 전송될 무선 베어러(radio bearer) 정보를 알려주는 단계(이하 "무선 베어러 셋업(radio bearer setup)" 단계)와 상기 RNC가 MBMS 서비스를 수신할 UE들이 위치하고 있는 셀들로 Iub 인터페이스상에 구성될 트랜스포트 베어러(transport bearer) 정보와 무선 베어러 정보를 알려주는 단계(이하 "무선 링크 셋업(radio link setup)" 단계)로 구분된다. 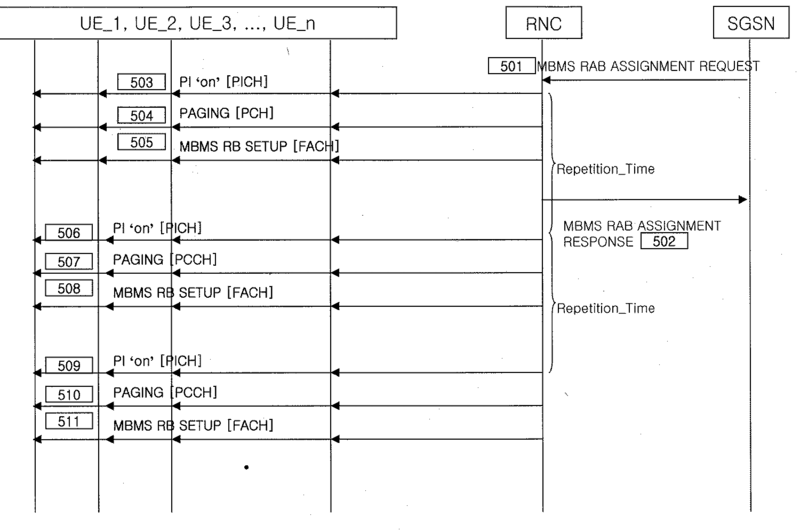 , Where the radio resource allocation process, the RNC steps to inform the MBMS radio bearer to be transmitted (radio bearer) information from the cell to the UE located in a particular cell (the "Radio Bearer Setup (radio bearer setup ) "phase) and the RNC is in the cells which the UE are located to receive the MBMS service transport bearer to be configured on the Iub interface (transport bearer) information and the phase indicating the RB information (the" radio link setup (radio link is divided into setup) "step). 상기 무선 베어러 셋업 단계는 도 4를 참조하여 후술될 것이다. The radio bearer setup step is described below with reference to FIG. 상기 무선 자원 할당 과정이 완료되면, 특정 MBMS 서비스를 수신하고자 하는 모든 UE들은 상기 특정 MBMS 서비스가 제공될 무선 링크 관련 정보와 상기 서비스가 처리될 상위 계층 정보를 인지하게 되며, 상기 UE들이 속한 셀들은 상기 무선 링크와 Iub 인터페이스 설정을 완료한다. When the radio resource allocation process is completed, all the UE may be that if the particular MBMS service, radio link-related is to be provided information and higher layer information, the service is to be treated to receive a particular MBMS service, the UE that cells belonging to thus completing the radio link setup and Iub interfaces. 이렇게 상기 RNC와 UE들간에 MBMS 서비스 제공을 위한 준비가 완료된 상태에서, 상기 코어 네트워크는 상기 RNC를 통해 상기 UE들로 MBMS 서비스 데이터를 전송하는 MBMS 데이터 전송 과정을 수행한다(207단계). To do this in the RNC and the preparation for the MBMS service completed between the UE state, the core network performs an MBMS data transfer process of transferring MBMS service data to the UE via the RNC (step 207). 이후 상기 MBMS 서비스 데이터 전송이 완료되면 상기 UE와 코어 네트워크간에는 상기 설정되어 있는 무선 자원들, 즉 트랜스포트 베어러 및 무선 베어러를 해제하는 무선 자원 해제 과정을 수행한다(208단계). Since the MBMS data when the transfer is completed and performs the UE and the core network, the radio resources that are among the settings, i.e., the radio resource release process for releasing a transport bearer and a radio bearer (Step 208). 이하 도 3을 참조하여 상기 도 2의 203단계 내지 206단계에서의 신호 흐름을 보다 구체적으로 살펴보면 다음과 같다. With reference to FIG. 3 to FIG Looking at the flow of the signals at step 206 to step 203 of the second more specifically as follows. 상기 도 2에서 CN은 SGSN(130), 전송 네트워크(120) 및 MB-SC(110)를 포괄하는 용어로서 사용되고 있으나 후술될 설명에서는 무선 접속망(Radio Access Network, 이하 "RAN"이라 칭함)의 동작에 대해 상세히 기술될 것이다. In the Figure 2 CN are SGSN (130), operation of the transmission network 120 and the MB-SC is used as a term encompassing 110, but the description will be described later, the radio access network (Radio Access Network, hereinafter "RAN" as referred to) on will be described in detail. 따라서, 후술될 설명에서는 CN의 구성들 중 SGSN만을 고려하도록 한다. Therefore, in the description which will be described later so as to consider only the SGSN of the structure of the CN. 상기 도 2의 202단계에서의 서비스 안내를 통해 임의의 MBMS 서비스에 대한 기본 정보, 즉 서비스 ID 등을 인지한 UE는 CELL_FACH 상태에서 SGSN(130)으로 MBMS 패킷 데이터 프로토콜(PDP: Packet Data Protocol, 이하 "PDP"라 칭하기로 한다) 컨텍스트(context) 활성화 요구(ACTIVATE MBMS PDP CONTEXT REQUEST) 메시지(message)를 송신한다(301단계). FIG any basic information about the MBMS service, i.e., UE A that the service ID, etc., to SGSN (130) in a CELL_FACH state MBMS packet data protocol (PDP through the service guide in step 202 of the 2: Packet Data Protocol, hereinafter and a "PDP" referred la) transmits a context (context) activation request (aCTIVATE MBMS PDP cONTEXT rEQUEST) message (message) (step 301). 여기서, 상기 PDP 컨텍스트(context)는 제1 PDP 컨텍스트(primary PDP context)와 제2 PDP 컨텍스트(second PDP context)로 분류된다. Here, the PDP context (context) are sorted in claim 1 PDP context (primary PDP context) and the PDP context 2 (second PDP context). 상기 제2 PDP 컨텍스트는 상기 제1 PDP 컨텍스트와 동일한 정보를 가지는 PDP 컨텍스트, 즉 제1 PDP 컨텍스트가 존재할 경우에만 존재하는 컨텍스트로서 상기 제1 PDP 컨텍스트의 정보를 그대로 재 사용한다. 2 wherein the PDP context is the first re-used as the information on the first PDP context, as a PDP context, that context that exists only when the first PDP context is present having the same information as PDP context. 이렇게 상기 제1 PDP 컨텍스트와 제2 PDP 컨텍스트에서 사용하는 정보는 동일하다. This information used by the first PDP context 1 and the PDP context 2 is the same. 다만 실제 패킷 데이터가 전송되는 패킷 무선 서비스(GPRS: General Packet Radio Service, 이하 "GPRS"라 칭하기로 한다) 터널링 프로토콜(GTP: GPRS Tunneling Protocol, 이하 "GTP"라 칭하기로 한다) 터널(tunnel)이 상이하다. However, the actual packet packet radio service in which data is transmitted (GPRS: and as referred General Packet Radio Service, hereinafter "GPRS" d) Tunneling Protocol (GTP: will be referred to as GPRS Tunneling Protocol, hereinafter "GTP") tunnel (tunnel) the it is different. 여기서, 상기 GPRS는 UMTS 네트워크에서 수행하는 패킷 데이터 서비스이다. Here, the GPRS is a packet data service performed in the UMTS network. 또한, 상기 MBMS PDP 컨텍스트 활성화 요구 메시지에 포함되는 파라미터(parameter)들로는 네트워크 계층 서비스 접속 포인트 식별자(NSAPI: Network layer Service Access Point Identifier, 이하 "NSAPI"라 칭하기로 한다)와, TI와, PDP 타입(type)과, PDP 어드레스(address)와, 접속 포인트 네트워크(Access Point Network)와, 서비스 품질(QoS: Quality of Service)등이 있다. In addition, include the parameter (parameter) included in the MBMS PDP context activation request message to the network layer service access point identifier (NSAPI: will be referred to as Network layer Service Access Point Identifier, hereinafter "NSAPI") and, TI and, PDP-type ( include quality of service): type) and, PDP address (address), and a network access point (Access point network), and quality of service (QoS. 여기서, 상기 이동통신시스템에서 GTP 터널을 생성하는 경우는 상기 UE(161)가 코어 네트워크, 즉 SGSN(130)에 요청하는 경우, 즉 UE 초기 활성화(UE-Initiated Activate)와 외부 네트워크로부터 상기 코어 네트워크에 요청하는 경우, 즉 네트워크 요청 활성화(Network Requested Activate)의 두 가지 경우로 구분된다. Here, when generating a GTP tunnel in the mobile communication system, if the request to the UE (161) the core network, i.e. SGSN (130), that is, UE initially enabled (UE-Initiated Activate) and the core network from an external network If the request to, that is divided into two cases of the activation request, the network (network requested activate). 상기 SGSN(130)은 상기 UE(161)로부터 MBMS PDP 컨텍스트 활성화 요구 메시지를 수신하면 상기 UE(161)가 해당 MBMS 서비스를 요청한 첫 번째 UE일 경우 상기 해당 MBMS 서비스를 위한 MBMS PDP 컨텍스트를 생성하고, 상기 생성한 MBMS PDP 컨텍스트에 상기 UE(161) 정보를 저장한 후 상기 SGSN(130)에 연결되어 있는 게이트웨이 패킷 무선 서비스 지원 노드(GGSN: Gateway GPRS Support Node, 이하 "GGSN"이라 칭하기로 한다, 도시하지 않음)와 일련의 동작들을 수행한다. The SGSN (130) upon receiving the MBMS PDP context activation request message from the UE (161) when the UE (161) is in the first UE that requested the corresponding MBMS service generates the MBMS PDP context for the corresponding MBMS service, in the generated MBMS PDP context, the UE (161), save the information and the gateway packet that is connected to the SGSN (130) radio service support node (GGSN: will be referred to as a gateway GPRS support node, hereinafter "GGSN", shown no) and performs a series of operations. 여기서, 상기 SGSN(130)이 상기 GGSN과 수행하는 동작들은 GTP 터널 셋업을 위한 동작들로서, 상기 SGSN(130)이 상기 UE(161)로부터 수신한 MBMS PDP 컨텍스트 활성화 요구 메시지에 포함되어 있는 파라미터들을 상기 GGSN에 통보하면, 상기 GGSN은 상기 파라미터들을 가지고 GTP 터널을 셋업한다. Here, the operation to the SGSN (130) is performed and the GGSN are the parameters that are included in as the operation for a GTP tunnel set up, the SGSN (130) the MBMS PDP context activation request message received from the UE (161) If the notification to the GGSN, the GGSN sets up a GTP tunnel with the parameters. 또한, 상기 MBMS PDP 컨텍스트는 임의의 MBMS 서비스에 관련된 정보들이 저장되어 있는 변수들의 집합이며, 상기 MBMS PDP 컨텍스트 활성화 요구 메시지를 전송한 UE들의 명단과, 상기 UE들의 위치 정보와, 상기 해당 MBMS 서비스 데이터를 전송할 트랜스포트 베어러(transport bearer) 관련 정보들이 저장된다. Furthermore, the MBMS PDP context is a set of variables that are information to be stored associated with the particular MBMS service, the location information of the UE list of the UE transmitting the MBMS PDP context activation request message, and the corresponding MBMS service data the information related to a transport bearer (bearer transport) is stored to send. 그리고 나서 상기 SGSN(130)은 상기 UE(161)로 MBMS PDP 컨텍스트 활성화 수락(ACTIVATE MBMS PDP CONTEXT REQUEST ACCEPT) 메시지를 송신한다(302단계). And then transmits the SGSN (130) is activated MBMS PDP Context Accept to the UE (161) (ACTIVATE MBMS PDP CONTEXT REQUEST ACCEPT) message (step 302). 여기서, 상기 MBMS PDP 컨텍스트 활성화 수락 메시지에는 상기 MBMS 서비스를 위해 그룹 호출(group paging)에 사용할 임시 멀티캐스트 그룹 식별 자(TMGI: Temporary Multicast Group Identity, 이하 "TMGI"라 칭하기로 한다)와 불연속 수신(DRX: Discontinuous Reception, 이하 "DRX"라 칭하기로 한다) 파라미터가 포함된다. Here, the MBMS PDP context activation accept message is the order the MBMS service group call (group paging) a temporary multicast group identifier to be used for (TMGI: will be referred to as Temporary Multicast Group Identity, hereinafter "TMGI") and discontinuous reception ( DRX: Discontinuous Reception will be referred to, hereinafter "DRX") include a parameter. 여기서, 상기 DRX 파라미터는 상기 UE(161)가 호출 표시 채널(PICH: Paging Indicator CHannel, 이하 "PICH"라 칭하기로 한다)을 모니터링 하는 주기와 관련되는 파라미터이다. Here, the DRX parameter is the UE (161) a paging indicator channel: a parameter that is related to the period for monitoring (PICH referred to as Paging Indicator CHannel, hereinafter "PICH" D). 상기 DRX 파라미터는 DRX 주기(CL: Cycle Length) 계수(coefficient)와 Np 등이 포함된다. And the like: (Cycle Length CL) coefficient (coefficient) Np and the DRX cycle parameter DRX. 상기 Np는 [18,36,72,144] 중 한 값으로 시스템 정보(SI: System Information)로 주어지며, 하나의 시스템 프레임에 몇 개의 호출 표시(PI: Paging Instance)들이 존재하는지를 나타내는 값이다. The Np has a value of [18,36,72,144] system information: is given by (SI System Information), some call indication in a system frame: a value that indicates whether there are (PI Paging Instance). 상기 TMGI와 상기 DRX 파라미터의 용법에 대해서는 동일 출원인에 의해 선 출원된 출원번호 P2002-34704에 자세히 기술되고 있다. For the use of the TMGI and the DRX parameter it is fully described in the Application No. P2002-34704 filed by the same applicant line. 이렇게 상기 SGSN(130)으로부터 MBMS PDP 컨텍스트 활성화 수락 메시지를 수신한 UE(161)는 아이들 상태로 천이한 후 대기한다. To do this the SGSN from the UE (161) receives the activation MBMS PDP context accept message 130 waits and then transitions to the idle state. 한편, 상기 SGSN(130)은 상기 해당 MBMS 서비스 개시 시점에 임박해서 혹은 MB-SC(110)로부터 첫 번째 MBMS 서비스 데이터를 수신한 후 상기 서비스를 받고자 하는 UE들, 즉 상기 MBMS PDP 컨텍스트 활성화 요구 메시지를 전송한 UE(161)가 속한 RNC(140)로 서비스 통지(notification) 메시지를 전송한다(303단계). On the other hand, the SGSN (130) is the UE to receive the service after receiving the first MBMS service data from the imminent to or MB-SC (110) at the time of start of the corresponding MBMS service, that is, the MBMS PDP context activation request message and a UE sends a message service notification (notification) to the RNC (140) belonging to the (161) transmits a (step 303). 상기 SGSN(130)은 상기 해당 MBMS 서비스를 요청한 UE들의 명단과, 상기 UE들이 속한 RNC들을 알고 있어 상기 해당 MBMS 서비스가 개시되면 해당 UE들이 속한 RNC들로 서비스 통지 메시지를 전송하게 된다. The SGSN (130) and the list of the UE that requested the corresponding MBMS service, if the corresponding MBMS service is started, the UE will know the RNC belongs is the UE to transmit a service notification message to the RNC belongs. 한편, 상기 SGSN(130)은 상기 MBMS 서비스 개시 시작을 알리는 서비스 통지 메시지에 상기 TMGI와 DRX 파라미터를 포함시켜 RNC(140)로 송신한다. On the other hand, the SGSN (130) is sent to the RNC (140) by including the TMGI and DRX parameters to the service notify message indicating a start of the MBMS service starts. 상기 RNC(140)는 상기 SGSN(130)으로부터 상기 서비스 통지 메시지를 수신하면, 304단계를 수행한다. The RNC (140) performs, step 304. Upon receiving the Service Notify message from the SGSN (130). 상기 304단계에서 이루어진 동작을 살펴보면, 상기 RNC(140)는 상기 서비스 통지 메시지에 포함되어 있는 TMGI와 DRX 파라미터를 이용하여 호출 시점(PO: Paging Occasion, 이하 "PO"라고 칭하기로 한다)과 PI를 산출한다. In operation made in the step 304, the RNC (140) calls the time using the TMGI and DRX parameters included in the service notification message (PO: and as referred called Paging Occasion, hereinafter "PO") and the PI It is calculated. 이와 마찬가지로 상기 UE(161) 역시 상기 MBMS PDP 컨텍스트 활성화 수락 메시지에 포함되어 있는 TMGI와 DRX 파라미터를 이용하여 PO 및 PI를 산출한다. Similarly, the UE (161) should also calculate the PO and PI using the TMGI and DRX parameters included in the MBMS PDP context activation accept message. 상기 RNC(140)는 상기 PI와 PO가 지시하는 시점의 PICH를 온(on) 혹은 오프(off)시켜 상기 UE(161)가 호출 채널(PCH: Paging CHannel, 이하 "PCH"라 칭하기로 한다)을 수신할지 여부를 지시한다. The RNC (140) is the PI and PO are the paging channel by turning on (on) or off (off) the PICH at the time of instructing the UE (161) (PCH: and as referred Paging CHannel, hereinafter "PCH" d) to indicate whether you want to receive. 여기서, 상기 PICH가 해당 PO의 PI에서 온되어 있을 경우에는 상기 UE(161)는 상기 PCH 신호를 수신하여 자신에 대한 호출을 감지한다. Here, if the PICH is on in the PI of the PO is the UE (161) detects the call to the own receiving the PCH signal. 이와는 반대로 상기 PICH가 오프되어 있을 경우 상기 UE(161)는 PCH를 수신하지 않는다. In contrast, the UE (161) if there is the PICH is off does not receive the PCH. 한편, 상기 RNC(140)는 상기 UE(161)에 대한 호출이 있을 경우 상기 PICH와 미리 설정되어 있는 설정 시간 후에 상기 PICH와 관련되는 PCH, 즉 associated PCH에 상기 서비스 통지 메시지 혹은 호출 메시지를 전송한다. On the other hand, the RNC (140) transmits the PCH, i.e., the service notification message or a call to the associated PCH message after a set time that is set in advance and the PICH is associated with the PICH if there is a call to the UE (161) . 따라서, 상기 UE(161)가 해당 MBMS 서비스가 곧 개시될 것임을 인지하도록 하거나 호출 메시지가 수신될 것임을 인지하도록 한다. Thus, to whether the UE (161) the corresponding MBMS service is to be initiated immediately or whether that page message that is to be received. 상기 서비스 통지 메시지는 일종의 호출 메시지이며, [message type, paging cause, TMGI]와 같은 정보들을 포함한다. The service notification message is a type of paging message, and includes information such as the [message type, paging cause, TMGI]. 상기 정보들 중 상기 paging cause는 상기 호출이 발생하는 이유를 나타낸다. The information of the paging cause indicates the reason that the call. 현재 W-CDMA 이동통신시스템에서 상기 MBMS 서비스에 적용할 수 있는 paging cause로는 'Terminating streaming call'이 있을 수 있으며, 기존의 paging cause가 아닌 별도의 새로운 paging cause를 MBMS 서비스를 위해 정의할 수도 있음은 물론이다. In the current W-CDMA mobile communication system roneun paging cause that can be applied to the MBMS service may be a 'Terminating streaming call', a separate new paging cause instead of the existing paging cause can be defined for MBMS services, Of course. 그리고 이하 상기 서비스 통지 메시지 혹은 호출 메시지를 설명의 편의상 "MBMS 호출 메시지"로 정의하기로 한다. And it will be defined below for the convenience of the service notification message or a call message description "MBMS paging message." 한편, 상기 UE(161)는 상기 계산한 PO의 PI에서 주기적으로 PICH를 감시하고, 상기 PICH가 온되어 있을 경우 associated PCH의 MBMS 호출 메시지를 수신하고, 상기 PICH가 오프되어 있을 경우 associated PCH를 수신하지 않는다. On the other hand, the UE (161) receives an associated PCH if there is the PICH is on receiving the MBMS Paging message in the associated PCH, and monitor a periodically PICH in the PI of the calculated PO, and there is the PICH is off I never do that. 여기서, 상기 PCH가 온되어 있다는 것은 상기 PO의 PI에서 상기 PICH에 '1'이라는 정보가 코딩되어 있는 경우를, 상기 PCH가 오프되어 있다는 것은 상기 PO의 PI에서 상기 PICH에 '0'이라는 정보가 코딩되어 있는 경우를 의미한다. Here, there is the PCH is on the case in which the information of "1" encoded to the PICH at the PI of the PO, but that the PCH is off, the information of "0" to the PICH at the PI of the PO It means a case that is coded. 한편, 상기 MBMS 호출 메시지를 수신한 UE(161)는 상기 MBMS 호출 메시지에 포함되어 있는 TMGI를 이용하여 어떤 MBMS 서비스가 개시될 것인지를 판단한다. On the other hand, UE receiving the MBMS Paging message 161, determines whether to be a certain MBMS service initiated by using the TMGI included in the MBMS Paging message. 만약 상기 TMGI가 상기 UE(161) 자신이 요청한 MBMS 서비스를 나타낼 경우 상기 UE(161)는 해당 MBMS 서비스 데이터 수신을 대기할 것이다. If the TMGI indicates that the UE (161) requesting the MBMS services they UE (161) will wait for the MBMS service data received. 한편, 상기 MBMS 호출 메시지를 수신한 UE(161)는 다시 CELL_FACH 상태로 천이하고, 상기 CELL_FACH 상태에서 상기 서비스 통지 메시지를 정상적으로 수신하였음을 나타내는 서비스 통지 응답(NOTIFICATION RESPONSE) 메시지를 상기 SGSN(130)으로 송신한다(305단계). On the other hand, in the one UE receiving the MBMS Paging message 161 again transitions to the CELL_FACH state, the CELL_FACH state, the service notification response (NOTIFICATION RESPONSE) The SGSN a message 130 indicating that it has normally received the service notify message and transmits (step 305). 상기 SGSN(130)은 상기 서비스 통지 응답 메시지를 수신한 후 상기 RNC(140)로 MBMS 무선 접속 베어러(RAB: Radio Access Bearer, 이하 "RAB"라 칭하기로 한다) 할당 요구(MBMS RAB ASSIGNMENT REQUEST) 메시지를 송신한다(306단계). The SGSN (130), after receiving the service notification response message MBMS radio connection to said RNC (140) bearer (RAB: and as referred Radio Access Bearer, hereinafter "RAB" d) allocation request (MBMS RAB ASSIGNMENT REQUEST) message, and transmits (step 306). 상기 MBMS RAB 할당 요구 메시지에는 상기 MBMS 서비스를 제공하기 위해 요구되는 서비스 품질(QoS: Quality of Service) 정보와 MBMS RAB을 설정할 UE들의 명단 등이 포함될 수 있다. The MBMS RAB assignment request message, the service is required to provide the MBMS service quality: could include (QoS Quality of Service) of the UE list information and MBMS RAB set up. 상기 설명에서는 상기 UE(161)만을 일 예로 하여 설명하였으나, 해당 MBMS 서비스를 수신하기를 요구하는 UE들이 다수일 경우에는 그 다수의 UE들 명단을 상기 MBMS RAB 할당 요구 메시지에 포함시켜 상기 RNC(140)로 송신하고, 상기 RNC(140)는 상기 다수의 UE들 각각에 대해 해당 MBMS 서비스 수신을 위한 이후의 동작들을 수행한다. In the above description has been described with only the UE (161) an example, if the UE a number required to receive the MBMS service has to include the plurality of UE to the list in the MBMS RAB assignment request message to the RNC (140 ) sent to, and the RNC (140) performs the operations subsequent to receiving the corresponding MBMS service for each of a plurality of the UE. 한편, 상기 RAB은 임의의 MBMS 서비스를 제공하기 위해 RAN에 구성되는 전송 자원들의 집합을 의미한다. On the other hand, the RAB is a set of transmission resources configured in the RAN in order to provide a particular MBMS service. 구체적으로 SGSN(130)과 RNC(140)사이(Iu 인터페이스)의 트랜스포트 베어러(transport bearer)와, RNC(130)와 Node B(160) 사이(Iub 인터페이스)의 트랜스포트 베어러와 무선 채널(radio channel)들을 포괄한다. Specifically, SGSN (130) and the RNC (140) between the transport bearer (transport bearer) and, RNC (130) and Node B (160) between a transport bearer and a radio channel (Iub interface) of (Iu interface) (radio It encompasses channel). 상기 RNC(140)는 상기 SGSN(130)으로부터 수신한 MBMS RAB 할당 요구 메시지에 상응하게 상기 해당 MBMS 서비스를 위한 무선 베어러 정보(MBMS RB info)를 결정한다. The RNC (140) determines the RB information (MBMS RB info) for the corresponding MBMS service corresponding to the MBMS RAB assignment request message received from the SGSN (130). 여기서, 상기 MBMS 무선 베어러 정보는 계층 2(Layer 2, 이하 "L2"라고 칭하기로 한다) 정보와 계층 1(Layer 1, 이하 "L1"이라 칭하기로 한다) 정보를 포괄한다. Here, the MBMS RB information (hereinafter referred to as Layer 2, hereinafter "L2") layer 2 (will be referred to as Layer 1, hereinafter "L1") information and layer 1 covers the information. 상기 L2 정보로는 무선 링크 제어(RLC: Radio Link Control, 이하 "RLC"라 칭하기로 한다)/패킷 데이터 수렴 프로토콜(PDCP: Packet Data Convergence Protocol, 이하 "PDCP"라 칭하기로 한다) 관련 정보 등이 포함될 수 있다. In the L2 information, radio link control (RLC: will be referred to as Radio Link Control, hereinafter "RLC") / packet data convergence protocol (PDCP: and a Packet Data Convergence Protocol, hereinafter "PDCP" La referred) etc. Related Information It may be included. 그리고 상기 L1 정보로는 전송 포맷 셋(TFS: Transport Format Set, 이하 "TFS"라 칭하기로 한다) 정보와, 전송 포맷 조합 셋(TFCS: Transport Format Combination Set, 이하 "TFCS"라 칭하기로 한다) 정보와, 채널화 코드(channelization code) 정보와, 전송 전력(transmit power) 관련 정보등이 포함될 수 있다. And in the L1 information, transport format set (TFS: will be referred to as Transport Format Set, or less "TFS") information, transport format combination set (TFCS: will be referred to as Transport Format Combination Set, hereinafter "TFCS") information and, it may be included, such as channelization codes (channelization code) information, and a transmission power (transmit power) information. 한편, 상기 RNC(140)는 상기 UE 명단을 이용해서 MBMS RAB을 설정할 셀을 결정하는데, CELL_FACH 상태에 있는 UE들의 위치를 셀 단위로 인지하므로, UE 명단을 셀 명단으로 치환할 수 있는 것이다. On the other hand, the RNC (140) is located so that the position of the UE in, CELL_FACH state to determine the cell to set the MBMS RAB using a list of the UE cell by cell, to substitute the UE list, the cell list. 따라서, 상기 RNC(140)는 하기에서 설명할 MBMS 무선 베어러 셋업(MBMS RB SETUP) 메시지를 셀 별로 전송하며, UE들이 위치하고 있는 셀들의 숫자만큼 상기 MBMS 무선 베어러 셋업 메시지를 반복 전송한다. Thus, the RNC (140) transmits the MBMS Radio Bearer Setup (MBMS RB SETUP) message to be described below for each cell and transmits as much as the number of cells which the UE are located repeat the MBMS radio bearer setup message. 상기 MBMS 무선 베어러 정보를 결정한 RNC(140)는 상기 UE(161)로 MBMS 무선 베어러 셋업 메시지를 송신한다(307단계). The MBMS RNC (140) determining a radio bearer information transmits an MBMS RB Setup message to the UE (161) (307 steps). 그러면 상기 UE(161)는 상기 수신한 MBMS 무선 베어러 셋업 메시지에 포함되어 있는 MBMS 무선 베어러 정보에 상응하게 MBMS 무선 베어러를 셋업한 후 MBMS 무선 베어러 셋업 완료(MBMS RB SETUP COMPLETE) 메시지를 상기 RNC(140)로 송신한다(308단계). Then, the UE (161) is then to correspond to the MBMS RB information included in the received MBMS Radio Bearer Setup message, setting up the MBMS RB MBMS radio bearer setup completion (MBMS RB SETUP COMPLETE) the messages RNC (140 ) and transmits (step 308). 상기 RNC(140)는 상기 UE(161)로부터 MBMS 무선 베어러 셋업 완료 메시지를 수신함에 따라 상기 SGSN(130)으로 MBMS 무선 베어러 할당 응답(MBMS RAB ASSIGNMENT RESPONSE) 메시지를 송신한다(309단계). The RNC (140) transmits the UE (161) from the MBMS Radio Bearer Setup Complete message to the SGSN to (130) Upon receiving MBMS radio bearer assignment response (MBMS RAB ASSIGNMENT RESPONSE) message (step 309). 그러면 상기 SGSN(130)은 상기 UE(161)로 상기 해당 MBMS 서비스에 대한 데이터 전송을 시작한다(DATA TRANSFER)(207단계). This will be the SGSN (130) starts the data transmission for the corresponding MBMS service to the UE (161) (DATA TRANSFER) (step 207). 한편, 상기 도 3에서 설명한 메시지들 중 서비스 통지 메시지와, MBMS 무선 베어러 셋업 메시지는 그룹 메시지(group message)이다. On the other hand, with messages of the Service Notify message illustrated in FIG 3, MBMS radio bearer setup message is a group message (group message). 여기서, 상기 그룹 메시지라 함은 하나의 메시지를 다수의 UE들이 수신하도록 한 메시지를 의미한다. Here, the term the group message refers to a message a message to a plurality of UE to receive. 즉, 상기 304단계에서 다수의 UE들이 동일한 PO의 PI를 참조해서 상기 PICH, 즉 서비스 통지 메시지 수신 여부를 결정하며, 상기 TMGI는 서비스 통지 메시지를 수신할 UE 들을 나타내므로, 하나의 서비스 통지 메시지를 다수의 UE들이 수신하게 된다. That is, with reference to a plurality of UE are PI of the same PO in the step 304 determines whether the PICH, i.e., receiving service notification message, the TMGI exhibits the UE can receive service notification message, a single service notification message a plurality of UE are received. 또한 상기 307단계에서 설명한 MBMS 무선 베어러 셋업 메시지 역시 공통 채널인 순방향 접근채널(FACH : Forward Access CHannel)을 통해 전송하는 한편 상기 MBMS 무선 베어러 셋업 메시지에 TMGI등을 삽입해서 다수의 UE들이 공통적으로 수신하도록 지정하고 있다. In addition, MBMS radio bearer setup message also the common channel is a forward access channel described in the step 307: that a plurality of UE are commonly received by inserting the TMGI including the other hand, the MBMS Radio Bearer Setup message sent by the (FACH Forward Access CHannel) It has been specified. 도 4는 전술한 도 3에서 307단계와 308단계의 상세 신호 흐름을 보이고 있는 도면이다. Figure 4 is a diagram illustrating a detailed signal flow for steps 307 and step 308 in Figure 3 above. 상기 도 4를 설명하기에 앞서, RNC(140)는 상기 도 1에서 설명한 바와 같이 셀1(160)과 셀 2(170)를 관리하며, 상기 도 4를 설명함에 있어 편의상 상기 RNC(140)의 셀1(160)에 존재하는 UE1(161)과 UE2(162)를 포함한 n개의 UE들이 동일한 임의의 MBMS 서비스에 대한 서비스 요청을 했다고 가정하기로 한다. Before a description of FIG. 4, RNC (140), making these managing the cell # 1 160 and cell # 2 170 as described in connection with FIG 1, and description of FIG. 4 for the sake of convenience the RNC (140) it is assumed that n number of UE, including the UE1 (161) and UE2 (162) existing in the cell # 1 160 has a service request for any of the same MBMS service. 또한, 상기 도 3에서 설명한 단계들과 동일한 동작을 수행하는 단계들은 상기 도 3에서 사용한 참조번호와 동일한 참조부호를 사용하기로 한다. In addition, performing the same operation as the steps described with reference to Figure 3 are to use the same reference numerals as the reference numerals used in FIG. 상기 도 4를 참조하면, RNC(140)는 상기 SGSN(130)이 서비스 통지 응답메시지를 수신함에 따라 송신하는 MBMS RAB 할당 요구 메시지를 수신한다(306단계). Referring to FIG. 4, RNC (140) is the SGSN (130) receives the MBMS RAB Assignment Request message to be transmitted in accordance with a service notification response message to receiving (step 306). 그러면 상기 RNC(140)는 상기 MBMS RAB 할당 요구 메시지를 수신함에 따라 MBMS 무선 베어러 셋업 메시지를 상기 n개의 UE들로 송신한다(401단계). Then, the RNC (140) transmits an MBMS radio bearer setup message Upon receiving the MBMS RAB assignment request message to the n UE (step 401). 상기 MBMS 무선 베어러 셋업 메시지에는 상기 MBMS 무선 베어러 정보와, RRC 상태 지시자가 포함되며, 상기 RRC 상태 지시자는 상기 RNC(140)와 상기 n개의 UE들간에 제어 메시지 교환이 종료됨에 따라 CELL_PCH 상태로 천이하도록 지정된다(RRC STATE INDICATOR = CELL_PCH). And the MBMS radio bearer information, the MBMS RB Setup message, and includes the RRC state indicator, the RRC state indicator to transition to the CELL_PCH state as the control message exchange end to the RNC (140) and between the n UE It is designated (RRC STATE INDICATOR = CELL_PCH). 또한, 상기 MBMS 무선 베어러 셋업 메시지는 FACH를 통해 셀별로 전송되며, CELL_FACH 상태에 있는 상기 UE들은 상기 MBMS 무선 베어러 셋업 메시지를 수신하는 것이 가능하다. In addition, the MBMS radio bearer setup message is transmitted for each cell over the FACH, the UE in the CELL_FACH states, it is possible to receive the MBMS Radio Bearer Setup message. 즉, 상기 MBMS 무선 베어러 셋업 메시지는 한 셀에 공통된 MBMS 무선 베어러 정보를 전달하기 위한 메시지이다. That is, the MBMS RB SETUP message is a message for transmitting the common MBMS RB information for one cell. 따라서, 모든 UE들에게 하나씩 전송하는 것 보다 하나의 메시지를 통해 전송하는 것이 바람직하다. Therefore, it is preferred to send it via a single message than to send to all the UE by one. 따라서, UMTS 이동통신시스템에는 FACH로 정의되는 일종의 방송채널이 존재함에 따라, 상기 FACH를 통해 상기 MBMS 무선 베어러 셋업 메시지를 전송할 수 있다. Thus, it UMTS mobile communication system may be as a kind of broadcast channels to be defined by the FACH is present, through the FACH to transmit the MBMS Radio Bearer Setup message. 상기 MBMS 무선 베어러 셋업 메시지를 수신한 n개의 UE들 각각은 상기 MBMS 무선 베어러 셋업 메시지에 대한 응답 메시지, 즉 MBMS 무선 베어러 셋업 완료 메시지를 상기 RNC(140)로 각각 전송한다(402-1단계, 402-2단계, 402-3, ..., 402-n). The MBMS n of the respective UE has received the Radio Bearer Setup message, each sends a response message, i.e., MBMS radio bearer setup completion message for the MBMS RB SETUP message to the RNC (140) (402-1 step, 402 step -2, 402-3, ..., 402-n). 그리고 n개의 UE들은 상기 MBMS 무선 베어러 셋업 메시지에 RRC 상태 지시자가 CELL_PCH로 지정되어 있음에 따라 자신들의 상태를 CELL_PCH로 천이한다. And n number of UE should transition to the CELL_PCH state, depending on their that the MBMS Radio Bearer Setup message, RRC state indicator in is designated as the CELL_PCH. 전술한 절차에 있어, 상기 UE들 각각은 상기 MBMS 무선 베어러 셋업 완료 메시지를 랜덤 억세스 채널(RACH : Random Access CHannel)을 사용하여 전송할 수 있다. In the above-described procedure, the UE in each of the random access channel to the MBMS Radio Bearer Setup Complete message: can be transmitted by using the (RACH Random Access CHannel). 하지만, 상기 RACH는 용량이 제한되어 있어 동일한 시점에 여러 UE들이 상기 MBMS 무선 베어러 셋업 완료 메시지의 전송을 시도하게 되면 시스템 성능에 심각한 영향을 초래할 수 있다. However, the RACH may When multiple UE will attempt to transmit the MBMS Radio Bearer Setup Complete message at the same time, there is a limited capacity, it can seriously affect system performance. 상기 도 4에서 보여지듯이 상기 UE들 각각이 상기 MBMS 무선 베어러 셋업 완료 메시지의 전송을 결정하는 시점은 상기 401단계가 완료된 시점과 거의 일치함에 따라 모든 UE들에 있어 거의 동일하다고 할 수 있다. As shown in FIG 4 the point when the UE each determine the transmission of the MBMS Radio Bearer Setup Complete message, it can be said that almost the same for all the UE, as almost the same as the time when the step 401 has been completed. 따라서, 많은 UE들로부터 동시에 전송되는 상기 MBMS 무선 베어러 셋업 완료 메시지들이 폭주함으로 인해 발생할 수 있는 시스템 성능이 저하되는 문제가 해결되어야 할 것이다. Accordingly, it would be a problem that the MBMS RB setup completion message to the congestion by the system performance that may be caused to be lowered at the same time transmitted from a number of UE must be solved. 따라서, 상기한 바와 같은 문제점을 해결하기 위한 본 발명의 목적은 멀티캐스트 멀티미디어 방송 서비스를 제공하는 이동통신시스템에서 시스템 성능에 영향을 미치지 않도록 제어 메시지를 송/수신하는 방법을 제공함에 있다. Accordingly, it is an object of to solve the problems as described above, the present invention is a control message so as not to affect the system performance in a mobile communication system providing a multimedia broadcast multicast service to provide a method for transmitting / receiving. 본 발명의 다른 목적은 멀티캐스트 멀티미디어 방송 서비스를 제공하는 이동통신시스템에서 동일 시점에서 메시지의 폭주가 발생하지 않도록 제어 메시지를 송/수신하는 방법을 제공함에 있다. Another object of the present invention is a control message to avoid congestion of the message at the same time generated in the mobile communication system providing a multimedia broadcast multicast service to provide a method for transmitting / receiving. 본 발명의 또 다른 목적은 멀티캐스트 멀티미디어 방송 서비스를 제공하는 이동통신시스템에서 그룹 제어 메시지에 대응한 응답 메시지들을 전송하지 않더라도 멀티캐스트 멀티미디어 방송 서비스를 위한 절차가 이루어지도록 하는 제어 메시지 송/수신방법을 제공함에 있다. A further object of the present invention is multicast in a mobile communication system providing a multimedia broadcasting service without transmitting a response message corresponding to the group control message multicast a procedure for a multimedia broadcast service for the control message transmitting / receiving method to occur to provide. 본 발명의 또 다른 목적은 일정한 시차를 두고 멀티캐스트 멀티미디어 방송 서비스를 위한 무선 베어러 정보를 지속적으로 전송함으로써 멀티캐스트 멀티미디어 방송 서비스 무선 베어러 셋업 메시지를 수신하지 못한 사용자 단말들이 주기적으로 전송되는 멀티캐스트 멀티미디어 방송 서비스 무선 베어러 정보에 의해 원하는 멀티캐스트 멀티미디어 방송 서비스를 이용할 수 있도록 하는 제어 메시지 송/수신방법을 제공함에 있다. A further object is multicast multimedia broadcasting that the user terminal does not receive a multicast multimedia broadcasting service radio bearer setup messages are sent periodically by sending an RB information continuously for a multicast multimedia broadcasting service with a predetermined time difference from the present invention a control message transmission / reception method that allows access to a multicast broadcast multimedia service desired by the service RB information to provide. 본 발명의 또 다른 목적은 셀 별로 이미 서비스가 이루어지고 있는 멀티캐스트 멀티미디어 방송 서비스들의 정보를 일정한 시차를 두고 전송함으로써 멀티캐스트 멀티미디어 방송 서비스 무선 베어러 셋업 메시지를 수신하지 못한 사용자 단말들이 이미 서비스가 진행되고 있는 멀티캐스트 멀티미디어 방송 서비스에 대응한 무선 베어러 정보를 요청할 수 있도록 하는 제어 메시지 송/수신방법을 제공함에 있다. It is another object of the present invention for each cell already in service by made and transmitted with a certain time difference information of multicast multimedia broadcasting service in the multicast multimedia broadcasting service radio bearer setup failure to receive the message user terminals already service is in progress the multicast control message transmitting / receiving method to request the radio bearer information corresponding to the multimedia broadcasting service in the can to provide. 상기한 목적들을 달성하기 위한 제1견지에 있어, 본 발명은 한 셀내의 복수의 단말들에게 각 단말들이 수신하고자 하는 방송 서비스들을 기지국 제어기를 통하여 상기 복수의 단말들에게 제공하는 이동 무선 시스템에서 상기 각 단말들이 실패 없이 상기 방송 서비스를 받기 위한 방법에 있어서, 상기 기지국 제어기로부터 상기 방송 서비스를 위한 제어 정보를 수신하지 못한 단말이 상기 셀 내에서 제공되고 있는 방송 서비스들의 종류들을 나타내는 방송 상태 메시지로부터 수신하고자 하는 방송 서비스를 확인하는 과정과, 상기 확인 후 상기 기지국 제어기로 상기 방송 서비스를 위한 제어정보를 요청하는 과정과, 상기 방송 서비스 제어정보를 수신하는 과정과, 상기 방송 서비스 제어정보의 수신을 확인하는 과정과, 상기 방송 서비스 제어정보에 In the first aspect for achieving the above object, the present invention is the in the mobile radio system which provides a plurality of terminals of a broadcast service to be received each of terminals to a plurality of terminals in a cell via the base station controller a method for receiving a broadcast service each terminals without failure, received from the base station controller from the broadcasting status message is not received control information for the broadcast service terminal indicative of the type of broadcast service is being provided within the cell process of identifying the broadcast service to and, as after the confirmation, the base station controller acknowledges the reception of the process and, the broadcasting service control information for receiving a process and, the broadcasting service control information that requests the control information for the broadcast service in the process, and the broadcasting service control information 해 상기 수신하고자 하는 방송 서비스를 받는 과정을 포함함을 특징으로 한다. It is characterized in that it comprises a process of receiving a broadcast service to be received above. 상기한 목적들을 달성하기 위한 제2견지에 있어, 본 발명은 한 셀내의 복수의 단말들에게 각 단말들이 수신하고자 하는 방송 서비스들을 기지국 제어기를 통하여 상기 복수의 단말들에게 제공하는 이동 무선 시스템에서 상기 기지국 제어기가 상기 각 단말들에 대해 실패 없이 상기 방송 서비스를 받도록 하기 위한 방법에 있어서, 상기 셀 내에서 제공되고 있는 방송 서비스들의 종류들을 나타내는 방송 상태 메시지를 전송하는 과정과, 상기 방송 상태 메시지에 의해 자신이 원하는 방송 서비스가 제공되고 있음을 확인한 단말로부터 상기 방송 서비스를 위한 제어정보의 재 전송 요청을 수신하는 과정과, 상기 재 전송을 요청한 단말로 상기 방송 서비스 제어정보를 전송하는 과정과, 상기 재 전송을 요청한 단말로부터 상기 방송 서비스 제어정보의 수 In the second aspect for achieving the above object, the present invention is the in the mobile radio system which provides a plurality of terminals of a broadcast service to be received each of terminals to a plurality of terminals in a cell via the base station controller a method to receive the broadcast service without fail for the base station controllers wherein in each terminal, by a process of transmitting the broadcasting status message that indicates the type of broadcast service is being provided within the cell and the broadcasting status message the process of he transmitting the broadcasting service control information from the UE confirming that there is provided a desired broadcast service in the process and, the terminal requests the re-transmission receiving a retransmission request of the control information for the broadcast service and the material from the terminal requests the transmission number of the broadcasting service control information 을 확인하는 과정을 포함함을 특징으로 한다. A it characterized in that it comprises the step of confirmation. 상기한 바와 같은 목적을 달성하기 위한 제3견지에 있어, 본 발명은 적어도 하나의 단말로부터 패킷 데이터 서비스가 요청될 시 상기 단말로 상기 패킷 데이터 서비스를 제공하는 이동통신시스템에서 무선망 제어부가 상기 단말들에 대해 실패 없이 패킷 데이터 서비스가 제공되도록 하는 방법에 있어서, 상기 단말로의 호출이 존재함을 나타내는 호출 지시자와, 상기 호출 지시자에 대응하여 상기 단말을 호출하는 호출정보 및 상기 패킷 데이터 서비스를 위한 무선 베어러 정보를 전송하는 과정과, 상기 패킷 데이터 서비스가 종료할 때까지 미리 설정된 주기로 상기 정보들을 재 전송하는 과정을 포함함을 특징으로 한다. 3 in perspective, the present invention is from at least one terminal to the terminal upon being a packet data service request in a mobile communication system supporting the packet data service to the mobile station radio network control unit for achieving the object as described above, a method for the to be a packet data service provided without fail for, and the call indicating that a call to the mobile station presence indicator, in response to the call indicator calls to call the user terminal information, and for the packet data service and transmitting the radio bearer information and the predetermined period until the packet data service is terminated is characterized in that it comprises the step of re-transmitting the information. 상기한 바와 같은 목적을 달성하기 위한 제4견지에 있어, 본 발명은 한 셀내의 복수의 단말들에게 각 단말들이 수신하고자 하는 패킷 데이터 서비스들을 기지국 제어부를 통하여 상기 복수의 단말들에게 제공하는 이동 무선 시스템에서 상기 각 단말들이 실패 없이 상기 패킷 데이터 서비스를 받기 위한 방법에 있어서, 상기 기지국 제어부로부터 상기 패킷 데이터 서비스에 따른 호출이 존재함을 나타내는 호출 지시자를 수신하고, 상기 호출 지시자에 의해 호출정보를 수신한 후 상기 패킷 데이터 서비스를 위한 무선 베어러 정보를 수신하는 과정과, 상기 무선 베어러 정보에 대응하여 응답 제어 메시지를 상기 무선망 제어부로 전송하지 않고, 상기 패킷 데이터 서비스에 대응하여 상기 무선망 제어부를 통해 전송되는 패킷 데이터를 수신하는 과정을 In the fourth aspect for achieving the object as described above, the present invention is a mobile radio provided to the plurality of terminal the packet data service to be received, each terminals to a plurality of terminals in a cell via the base station controller a method for receiving packet data services without the respective terminals fail in the system, from the base station controller receives a call indicator to indicate that the call is present in accordance with the packet data service, receiving the paging information by the call indicator after without transmitting a response control message in response to the steps of: receiving an RB information for the packet data service, the radio bearer information to the radio network controller, in response to the packet data service via the radio network controller the method comprising the steps of: receiving a packet data transmitted 함함을 특징으로 한다. It characterized by hamham. 이하, 본 발명에 따른 바람직한 실시 예를 첨부한 도면을 참조하여 상세히 설명한다. With reference to the accompanying drawings a preferred embodiment according to the present invention will be described in detail. 하기의 설명에서는 본 발명에 따른 동작을 이해하는데 필요한 부분만이 설명되며 그 이외 부분의 설명은 본 발명의 요지를 흩트리지 않도록 생략될 것이라는 것을 유의하여야 한다. DETAILED DESCRIPTION OF THE necessary for understanding the operations according to the present invention is to be noted that description of the other parts will be omitted so as ridges heutteu the subject matter of the present invention. 후술될 본 발명의 실시 예에서는 이동통신시스템에서 멀티캐스트 멀티미디어 방송 서비스를 제공하기 위해 요구되는 그룹 제어 메시지(MBMS RB SETUP 메시지 등)를 수신한 UE들이 응답 메시지를 전송하지 않도록 하고, 상기 응답 메시지(MBMS RB SETUP COMPLETE 메시지 등)을 전송하지 않음으로 인해 발생할 수 있는 문제점들을 해결하는 방법들에 대해 게시할 것이다. Embodiments of the present invention which will be described later example to not give UE that the response message has received the group of control messages required to provide the multicast multimedia broadcasting service in a mobile communication system (MBMS RB SETUP message, etc. ), and the response message ( It will be published on ways to solve the problems that might be caused by not sending the MBMS RB SETUP COMPLETE message, etc.). 이는 앞에서도 밝힌 바와 같이 그룹 제어 메시지에 대응하여 많은 UE들이 동시에 응답 메시지들을 전송하는 경우 발생할 수 있는 시스템 성능 저하를 방지하기 위해서이다. This is in order to prevent system performance degradation which may occur if a lot of UE simultaneously transmit a response message to the front corresponds to a group control message, as identified. 또한, 많은 UE들이 동시에 응답메시지들을 전송함으로써 발생하는 폭주 상태에서는 상기 MBMS 서비스를 받을 UE들의 상태를 정확하게 파악하기 어렵다. In addition, many UE to the congestion that occurs at the same time by transmitting the response message to the state it is difficult to accurately grasp the status of the UE to receive the MBMS service. 더불어 MBMS 서비스를 개시함과 동시에 과금이 수행될 경우에도 상기 UE들이 MBMS 서비스를 받고 있는 상황인지 여부를 정확히 파악하지 못하면, 과금상의 심각한 문제가 발생할 수 있음은 물론이다. In addition, even if the charging is performed, and at the same time initiating a MBMS service that the UE does not know exactly whether the circumstances under which the MBMS service, you may cause serious problems in accounting as a matter of course. 때문에 많은 UE들의 응답메시지 폭주에 따른 문제점을 해결코자 하는데 본 발명의 목적이 있음을 밝히는 바이다. Since bayida saying that the object of the present invention wishes to solve the problems according to the response message congestion in many UE. 상기 그룹 제어(Group Signaling) 메시지는 망으로부터 전송되는 하나의 메시지를 복수의 UE들이 수신해서 그에 따른 동작을 취하는 임의의 RRC 메시지를 의미한다. The control group (Group Signaling) message is received by a plurality of UE a message that is sent from the network refers to any RRC message to take action accordingly. 한편, 상기 그룹 제어 메시지의 일 예라 할 수 있는 MBMS 무선 베어러 셋업 메시지는 RNC가 결정한 MBMS 무선 베어러 정보를 해당 서비스를 수신하고자 하는 UE들에게 전달하고자 하는 목적을 가진다. On the other hand, MBMS radio bearer setup message to Cordillera one of the group control message has a purpose to be delivered to the UE to the RNC decides to receive the service, the MBMS RB information. 상기 제어 메시지의 다른 예로서 MBMS 무선 베어러 셋업 완료 메시지는 RNC가 모든 UE들이 상기 MBMS 무선 베어러 정보를 수신하였는지를 확인하기 위한 목적을 가진다. MBMS Radio Bearer Setup Complete message as another example of the control message the RNC has the purpose to verify whether all the UE to receive the MBMS RB information. 통상적으로 어떤 UE가 응답 메시지를 보내지 않을 경우, 해당 UE가 MBMS 무선 베어러 정보를 수신하지 못한 것으로 판단하고, 상기 MBMS 무선 베어러 셋업 메시지를 재 전송하는 등, 필요한 조치를 취할 수 있다. Usually in some cases the UE may not send a response message, it is determined that the UE does not receive the MBMS radio bearer information, and to take the necessary action, such as re-transmitted the MBMS Radio Bearer Setup message. 하지만, 후술될 본 발명의 제1실시 예에서는 일정한 시차를 두고 상기 MBMS 무선 베어러 정보를 지속적으로 전송하도록 하여, MBMS 무선 베어러 셋업 메시지를 수신하지 못한 UE들이 상기 주기적으로 전송되는 MBMS 무선 베어러 정보를 수신할 수 있도록 한다. However, in the first embodiment with a certain time difference the MBMS radio so as to continuously transmit the bearer information, and receiving the MBMS RB information UE fails to receive the MBMS Radio Bearer Setup messages in which the periodically transmitted according to the present invention which will be described later, so can. 또한, 후술될 본 발명의 제2실시 예에서는 무선망 제어부가 각 셀 별로 현재 제공되고 있는 MBMS 서비스들의 종류에 관한 정보 즉, 상기 MBMS 무선 베어러 셋업 메시지를 수신하지 못한 UE들로 하여금 현재 자신이 받고자 하는 MBMS 서비스가 이미 수행중임을 알리기 위한 정보를 해당 셀 내의 UE들로 전송한다. Further, in the second embodiment of the present invention which will be described later, let the a radio network controller does not receive the information, that is, the MBMS RB Setup message about the type of the MBMS services that are currently provided for each cell UE receive the current own the MBMS service transmits the information for notifying the already being performed by the UE within the cell. 따라서, UE들 각각은 자신이 요청한 MBMS 서비스가 이미 제공되고 있으면 이를 제공받기 위한 무선 베어러 정보를 상기 무선망 제어부로 요청하여 수신할 수 있도록 한다. Therefore, UE in each of which it is to, if the requested MBMS service is already provided to receive the request for radio bearer information for receiving them to the radio network controller. 한편, 후술될 실시 예들에서는 MBMS 서비스를 한정하여 기술하고 있으나 이는 모든 패킷 데이터 서비스를 통칭하는 용어로서 해석되어야 한다. On the other hand, in the embodiment described below, but the examples describe only the MBMS services which are to be interpreted as a general term for all the packet data service. 따라서, 본 발 명의 실시 예들은 MBMS 서비스를 제외한 다양한 패킷 데이터 서비스에 동일하게 적용할 수 있음은 자명할 것이다. Accordingly, the present example will be apparent to people that are equally applicable in a variety of packet data services other than the MBMS service. 후술될 본 발명의 제1실시 예는 앞에서도 밝힌 바와 같이 무선망 제어부가 현재 제공되고 있는 MBMS 서비스에 대응한 MBMS 무선 베어러 정보를 주기적으로 전송하여 줌으로써 해당 UE가 최초 MBMS 무선 베어러 정보의 수신에 실패하더라도 소정 주기 이후에 원하는 MBMS 무선 베어러 정보를 수신할 수 있도록 한다. Fails to receive the first embodiment earlier, said the radio network control unit by giving to periodically transmit the MBMS RB information corresponding to the MBMS service that is currently the UE first as MBMS RB information of the present invention which will be described later, even if to be able to receive the desired MBMS RB information after a predetermined period. 도 5는 본 발명의 제1실시 예에 따른 멀티캐스트 멀티미디어 방송 서비스를 제공하기 위한 무선 베어러 설정과정을 신호 흐름으로써 보이고 있는 도면이다. 5 is a diagram illustrating by a radio bearer setup process, the signal flow for providing a multimedia broadcast multicast service according to the first embodiment of the present invention. 상기 도 5에서 RNC(140)로부터 UE들로 전송되는 모든 메시지들은 그룹 시그널링(Group Signaling)에 의해 전송된다. FIG all messages sent in from 5 RNC (140) to the UE are transmitted by a group signaling (Signaling Group). 상기 그룹 시그널링은 RNC(140)가 하나의 메시지를 복수의 대상(UE들 또는 셀들)으로 전송하는 신호 전송방식을 통칭한다. The group signaling is known as a signal transfer method of transferring the RNC (140) a message to a plurality of destination (UE or cells). 상기 도 5를 참조하여 제1실시 예를 보다 구체적으로 살펴보면, 501단계에서 RNC(140)는 SGSN(130)으로부터 서비스 통지(MBMS RBA ASSIGNMENT REQUEST) 메시지를 수신한다. To FIG. 5, looking specifically than the first embodiment, in step 501, RNC (140) receives a notification service from the SGSN (130) (RBA MBMS ASSIGNMENT REQUEST) message. 상기 서비스 통지 메시지에는 해당 MBMS 서비스에 대응하여 TMGI와 DRX 파라미터 및 QoS 정보와 UE 명단 외에도 재 전송 주기(R_T : Repetition Time) 정보가 포함되어 있다. The service notification message corresponding to the MBMS service in addition to TMGI and DRX parameters and the QoS information to the UE list, the re-transmission cycle: it is included (R_T Repetition Time) information. 상기 RNC(140)는 상기 SGSN(130)으로부터 서비스 통지 메시지를 수신하면, 상기 서비스 통지 메시지에 포함되어 있는 TMGI와 DRX 파라미터를 이용하여 호출 시점(PO: Paging Occasion, 이하 "PO"라고 칭하기로 한다)과 PI를 산출한다. The RNC (140) is the Upon receiving the Service Notify message from the SGSN (130), the service using the TMGI and DRX parameters included in the notification message, the paging time point (PO: and as referred called Paging Occasion, hereinafter "PO" ), and it calculates a PI. 또한, 상기 RNC(140)는 상기 UE 명단을 이용하여 MBMS RB를 설정할 셀을 결정하고, QoS 정보를 이용해서 MBMS RB 파라미터를 결정한다. In addition, the RNC (140) determines the cells to set MBMS RB by using the UE list, and determines MBMS RB parameters by using the QoS information. 즉,MBMS 서비스의 수신을 요청한 UE들의 위치에 따라 MBMS 서비스를 송신할 셀을 결정하고, 그에 따른 무선 베어러(Radio Bearer)에 관한 정보를 결정하게 되는 것이다. That is, determines the cell to transmit the MBMS service based on the location of the UE requests the reception of the MBMS service, and will be to determine information about a radio bearer (Radio Bearer) thereof. 그리고, 상기 MBMS RB를 설정할 셀과 MBMS RB 파라미터가 결정되면 상기 RNC(140)는 503단계 내지 505단계에서 MBMS RB를 결정한 셀들로 그룹 시그널링을 통해 제공한다. Then, when the MBMS RB cell and the MBMS RB parameters are determined to set the RNC (140) is provided through the group signaling cells to determine the MBMS RB in step 503 to step 505. 상기 RNC(140)는 상기 PI와 PO가 지시하는 시점의 호출 표시 채널(PICH: Paging Indicator CHannel, 이하 "PICH"라 칭하기로 한다)을 온(on) 혹은 오프(off)시켜 상기 UE들로 전송함으로써 상기 UE들 각각에 대해 호출 채널(PCH: Paging CHannel, 이하 "PCH"라 칭하기로 한다)을 수신할지 여부를 지시한다. The RNC (140) is the PI and the paging indicator channel at which PO is indicated: transmitted to the on-the (PICH Paging Indicator CHannel, hereinafter referred to as "PICH" La referred) (on) or off (off) to the UE by calling channel for each of the UE: indicates whether to receive the (PCH will be referred to as Paging cHannel, hereinafter "PCH"). 즉, 상기 PICH는 호출 메시지(Paging Message)가 수신될 것임을 해당 UE들이 인지하도록 한다. In other words, the PICH is to recognize that the UE that has received the call message (Paging Message). 그리고, 상기 RNC(140)는 상기 PICH를 전송한 후 상기 서비스 통보 메시지를 통해 상기 SGSN(130)으로부터 제공받은 임의의 재 전송 주기를 검사하기 위한 재 전송 타이머를 구동한다. In addition, the RNC (140) drives the re-transmission timer for checking, after transmitting the PICH any re-transmission period of the received from the SGSN (130) through the service notification message. 상기 재 전송 타이머의 구동은 상기 PICH를 전송하기 전에 이루어지거나 상기 PICH를 전송한 후에 이루어질 수 있다. Operation of the retransmission timer can be done after or before transmitting the PICH transmitting the PICH. 이에 대응하여 상기 UE들은 MBMS PDP 컨텍스트 활성화 수락 메시지에 포함되어 있는 TMGI와 DRX 파라미터를 이용하여 PO 및 PI를 산출한다. In response, the UE can calculate the PO and PI using the TMGI and DRX parameters included in the Activate MBMS PDP Context Accept message. 그리고, 상기 503 단계에서 상기 PICH를 수신하고, 상기 산출한 PO의 PI가 지시하는 시점에서 상기 PICH가 온 또는 오프되어 있는 지를 검사한다. Then, at the time of receiving the PICH, and the PI of the PO is calculated indicated at the step 503 checks whether there is the PICH is on or off. 상기 UE들은 상기 검사 결과에 의해 이후 PCH를 통한 호출 메시지의 수신 여부를 인지하게 된다. The UE may become aware of whether or not to receive the paging message via the PCH after by the test results. 즉, 상기 PICH가 특정 PO의 PI에서 온되어 있을 경우 상기 PO와 PI에 대응한 UE는 상기 PCH을 통해 수신되는 신호를 수신하여 자신에 대한 호출을 감지한다. That is, if the PICH is on in the PI of the PO particular a UE corresponding to the PI and PO detects the call to his receiving a signal to be received on the PCH. 하지만, 오프되어 있는 PO의 PI에 대응하는 UE들의 경우에는 상기 PCH를 수신하지 않는다. However, in the case of the UE corresponding to the PI of the PO that is off it does not receive the PCH. 한편, 상기 RNC(140)는 504단계에서 특정 UE에 대한 호출이 있을 경우 상기 PICH와 미리 설정되어 있는 설정 시간 후에 상기 PICH와 관련되는 PCH, 즉 associated PCH에 호출 메시지를 전송한다. On the other hand, the RNC (140) if there is at step 504, a call to a specific UE and sends a page message on a PCH, i.e. associated PCH associated with the PICH after the set time that is previously set as the PICH. 이는 상기 특정 UE가 해당 MBMS 서비스가 곧 개시될 것임을 인지하도록 한다. This will be recognized that the particular UE that the corresponding MBMS service will start soon. 여기서, 상기 호출 메시지에는 UE 식별자 대신 TMGI 또는 SERVICE ID와 같은 그룹 식별자가 삽입된다. Here, the paging message is inserted in a group identifier, such as TMGI or SERVICE ID instead of the UE identifier. 이에 대응하여 호출 메시지가 수신될 것을 인지하고 있던 해당 UE들은 상기 504단계를 통해 호출 메시지를 수신한다. In response to the call message that was noted that the UE can be received and receives the paging message via the step 504. 그리고, 상기 호출 메시지에 의해 특정 MBMS 서비스에 대응하여 자신이 호출되고 있는 지를 판단한다. Incidentally, in response to the specific MBMS service by the call message to determine whether he is being called. 즉, 상기 호출 메시지가 수신될 것을 인지하고 있는 UE들은 상기 호출 메시지에 자신이 수신하고자 하는 MBMS 서비스의 식별자와 일치하는 식별자(TMGI 또는 SERVICE ID)가 포함되어 있을 경우, FACH를 통해 전송되는 모든 데이터를 수신하기 위한 Cell_FACH 상태로 천이한다. That is, if the UE that recognize that the call message is received may include the identifier (TMGI or SERVICE ID) that matches the identifier of the MBMS service to be received in their the page message, all data transmitted over the FACH and changes to the Cell_FACH state for receiving. 상기 RNC(140)는 상기 호출 메시지의 전송이 완료되면, 505단계에서 FACH를 통해 MBMS 무선 베어러 셋업(MBMS RB SETUP) 메시지를 전송한다. The RNC (140) is when the transfer is complete the call message, through the FACH in step 505 transmits an MBMS Radio Bearer Setup (MBMS RB SETUP) message. 상기 MBMS RB SETUP 메시지에는 앞서 결정한 MBMS RB 파라미터가 삽입된다. The MBMS RB SETUP message, MBMS RB parameters are inserted into the previously determined. 이에 대응하여, 상기 호출 메시지에 의해 호출이 이루어진 UE들은 상기 FACH를 통해 상기 MBMS RB SETUP 메시지를 수신한다. In response, UE is called by the page message are made to receive the MBMS RB SETUP message on the FACH. 그리고 상기 수신한 MBMS RB SETUP 메시지에 의해 특정 MBMS 서비스를 제공하기 위해 필요한 무선 베어러를 설정하는 절차를 수행한다. And it performs a procedure for setting up a radio bearer required for providing a specific MBMS service by the receiving the MBMS RB SETUP message. 즉, 상기 호출 메시지에 의해 호출이 이루어진 상기 UE들은 상기 MBMS 무선 베어러 셋업 메시지에 포함되어 있는 MBMS 무선 베어러 정보에 의거 L2/L1을 설정하고, 차후 상기 MBMS 무선 베어러를 통해 전송되는 MBMS 데이터를 수신한다. That is, the UE is called by the page message made are set to L2 / L1 according to MBMS RB info included in the MBMS Radio Bearer Setup message, and receives the MBMS data transmitted over the future the MBMS RB . 하지만, 특정 MBMS 서비스를 요청한 임의의 UE가 상기 FACH를 통해 상기 MBMS RB SETUP 메시지를 정상적으로 수신하지 못하는 상황이 발생할 수 있다. However, there may occur a random UE requesting a particular MBMS service can not normally receive the MBMS RB SETUP message on the FACH situation. 이러한 상황은 PI가 'on'인 것을 인지하는데 실패하거나, 열악한 무선 링크 상황으로 인해 상기 호출 메시지 또는 상기 MBMS RB SETUP 메시지의 수신에 실패하는 것에 기인한다. This situation is due to the PI fails to recognize that the 'on' or failure in reception of the page message or the MBMS RB SETUP message due to poor radio link conditions. 상기 UE들은 상기 MBMS RB SETUP 메시지를 수신하지 못하였음을 상기 RNC(140)로 통보하기 위한 어떠한 메시지도 전송하지 않는다. The UE can not send any message to be notified by the RNC (140) that it has not received the MBMS RB SETUP message. 단지, 일정 주기로 재 전송되는 PICH에 대해 상기 산출된 PO의 PI 감시를 지속하여 향후 상기 MBMS RB SETUP 메시지를 수신하기 위해 대기하게 된다. Only, for the PICH which is retransmitted periodically to sustain the PI monitoring of the calculated PO it is waiting to receive the next MBMS RB SETUP message. 따라서, 늦게나마 원하는 MBMS 서비스를 제공받을 수 있다. Therefore, it is possible to get late, albeit provide the desired MBMS service. 상기 RNC(140)는 상기 501단계에서 서비스 통보 메시지를 수신한 후 상기 503단계 내지 505단계가 수행되는 임의의 시점 또는 상기 FACH를 통한 MBMS RB SETUP 메시지를 전송한 후 서비스 통보 응답(MBMS RAB ASSIGNMENT RESPONSE) 메시지를 상기 SGSN(130)으로 전송할 수 있다. The RNC (140) after receiving the service notification message at the step 501 the step 503 to then step 505 transmits the MBMS RB SETUP message with a particular time or the FACH is carried out service notification response (MBMS RAB ASSIGNMENT RESPONSE ) it may transmit a message to the SGSN (130). 상기 서비스 통보 응답 메시지는 상기 서비스 통보 메시지에 대한 응답 메시지로, 상기 서비스 통보 메시지를 통해 요청된 MBMS RAB 설정이 성공적으로 완료되었음을 상기 SGSN(130)에게 통보하는 역할을 한다. The service notification response message serves to inform the SGSN (130) that a reply message for the service notification message, the MBMS RAB setup request with the service notification message is successful. 본 발명에서는 UE들로부터 상기 MBMS RB SETUP 메시지에 대응한 응답을 받지 않으므로, 상기 RNC(140)는 상기 MBMS RAB의 성공적 설정을 확인할 수 없다. According to the present invention does not receive from the UE a response corresponding to the MBMS RB SETUP message, the RNC (140) can not confirm the successful setup of the MBMS RAB. 하지만, 상기 MBMS RAB에 대응되는 MBMS RB SETUP 메시지 전송을 완료하면, 상기 MBMS RAB이 성공적으로 설정된 것으로 간주하고, 502단계에서 서비스 통보 응답 메시지를 송신한다. However, when completing the MBMS RB SETUP message transmission corresponding to the MBMS RAB, and the MBMS RAB is deemed successfully established, it transmits a service notification response message in step 502. 이 후 상기 RNC(140)는 앞서 구동한 재 전송 타이머를 통해 재 전송 주기가 도래하였는지를 검사한다. Thereafter it determines whether the RNC (140) is a re-transmission period arrives through the re-transmission timer, before driving. 상기 재 전송 주기가 도래하였다는 것은 재 전송 주기만큼의 시간이 경과하였다는 것으로서 상기 재 전송 타이머의 값이 '0'이 되었음을 의미한다. The re-transmission cycle was the advent means that the value of the retransmission timer "0" as was the time as the re-transmission period elapses. 상기 재 전송 주기가 도래하면, 상기 RNC(140)는 상기 재 전송 타이머를 재 구동하고, 상기 503단계 내지 상기 505단계를 통해 전송된 PICH, PCH 및 MBMS RB SETUP 메시지를 전송하는 FACH를 재 전송한다(506단계 내지 508단계). If the arrival is the re-transmission period, the RNC (140) transmits again the FACH to the re-transmission timer and restart the transmits the PICH, PCH and MBMS RB SETUP message sent through the step 503 to the step 505 (step 508 to step 506). 이때, 상기 506단계 내지 508단계에 대응하여 해당 UE들의 동작은 앞서 설명한 바와 동일하다. At this time, the operation of the UE in response to the step 506 to step 508 are the same as described above. 도 6은 본 발명의 제1실시 예에 따라 UE가 수행하게 되는 동작의 제어 흐름을 도시한 도면이다. 6 is a view showing a control flow of an operation that the UE is performed in accordance with a first embodiment of the present invention. 상기 도 6에서 보이고 있는 제어 흐름에 의한 동작은 특정 MBMS 서비스를 요청한 UE를 대상으로 하여 제안하고 있으며, 후술될 상세한 설명에 서도 UE가 특정 MBMS 서비스를 요청한 것을 가정하여 설명하고 있음에 유의해야 한다. Operation according to the control flow illustrated in FIG. 6 has been proposed to subject the UE requesting a particular MBMS service, even to the details will be described later, the UE should be noted that the explanation on the assumption that requested a particular MBMS service. 상기 도 6을 참조하여 UE의 동작을 살펴보기 전에 상기 UE의 동작에 의해 변화하는 상태를 살펴보면, CELL_PCH 상태라 함은 UE가 전용 채널(dedicated channel)을 셋업(setup)하지 않은 상태에서 PICH만을 셋업하여 PICH 신호를 수신하고 있는 상태를 나타낸다. Before with reference to the Figure 6 looking at the behavior of the UE Looking at the state change by operation of the UE, CELL_PCH state referred to is only set up PICH while the UE is not set up (setup) a dedicated channel (dedicated channel) to indicate a state in which receiving the PICH signal. 물론, 상기 CELL_PCH 상태에서 상기 PICH 신호를 수신하는 동안 상기 PICH 신호가 호출(paging)이 있음을 나타내는, 즉 PCH 신호를 수신해야함을 나타낼 경우 UE는 상기 PCH 신호를 수신한다. Of course, if the PICH signal for receiving the PICH signal in the CELL_PCH state the call (paging) exhibit haeyaham receive, that is, PCH signal indicating that the UE receives the PCH signal. 또한, CELL_FACH 상태라 함은 UE가 전용 채널을 셋업하지 않은 상태에서 FACH를 셋업하여 상기 FACH를 통해 수신되는 모든 제어 메시지에 상응하는 동작을 수행하는 상태를 나타낸다. Also referred to as CELL_FACH state by setting up an FACH while the UE is not set up a dedicated channel it shows the state of performing the operation corresponding to all the control messages received through the FACH. 그리고 UE는 상기 CELL_PCH 상태에서 상기 PCH 신호를 수신하게 되면 상기 CELL_FACH 상태로 천이하게 된다. And the UE when it receives the PCH signal in the CELL_PCH state will transition to the CELL_FACH state. 상기 도 6을 참조하면, UE는 MBMS PDP 컨텍스트 활성화 수락 메시지를 통해 TMGI와 DRX 파라미터를 수신하고, 601단계에서 상기 TMGI와 상기 DRX 파라미터를 이용하여 PO 및 PI를 산출한다. Referring to Figure 6, UE calculates a PO and a PI using the TMGI and the DRX parameters in the received TMGI and DRX parameters through the MBMS PDP context activation accept message, step 601. 상기 PO와 PI를 산출한 상기 UE는 602단계로 진행하여 RNC(140)로부터 수신되는 PICH에 대응하여 상기 산출한 PO의 PI를 지속적으로 감시한다. Wherein the calculating the PO and PI UE proceeds to step 602 in response to the PICH received from the RNC (140) and continuously monitoring the PI of the PO was calculated. 그리고, 상기 UE는 603단계에서 상기 감시 결과에 의해 자신을 호출하기 위해 상기 PICH를 구성하는 PO들의 PI들 중 상기 산출한 PO의 PI가 "on"으로 설정되어 있는 지를 판단한다. In addition, the UE determines in step 603 whether the PI of the PO is calculated by the PI of the PO constituting the PICH in order to call itself by the monitoring result is set to "on". 만약, 상기 산출한 PO의 PI가 "off"되어 있다고 판단되면 상기 UE는 상기 602단계로 진행하여 상기 산출한 PO의 PI에 의해 상기 PICH를 지속적으로 감시한다. If it is determined that the PI of the PO is calculated "off", the UE continuously monitors the PICH by the PI of the PO by the calculation proceeds to step 602. 하지만, 상기 산출한 PO의 PI가 "on"되어 있다고 판단되면 상기 UE는 604단계로 진행한다. However, if it is determined that the PI of the PO is calculated "on", the UE proceeds to step 604. 상기 UE는 상기 604단계에서 상기 RNC(140)로부터 관련된 PCH를 수신한다. The UE receives the PCH from the associated RNC (140) in step 604. 상기 관련된 PCH는 상기 'on'으로 설정된 PI와 미리 약속된 시간만큼 이격되어 상기 RNC(140)로부터 전송된 PCH를 의미한다. The associated PCH is spaced by a preset and PI is set to the 'on' time refers to the PCH transmitted from the RNC (140). 상기 UE는 상기 PCH를 수신하면 605단계에서 상기 호출 메시지의 식별자가 자신이 수신하고자 하는 서비스의 식별자와 일치하는 지를 판단한다. The UE determining whether the identifier of the paging message matches the identifier of the service to be received in their in step 605 upon receipt of the PCH. 즉, 상기 UE는 상기 호출 메시지에 포함되어 있는 TMGI 또는 서비스 ID가 자신이 인지하고 있는 TMGI 또는 서비스 ID와 일치하는 지를 판단한다. That is, the UE determines whether a TMGI or service ID included in the paging message matches the TMGI or service ID in which they are recognized. 만약, 상기 호출 메시지의 식별자가 자신이 수신하고자 하는 서비스의 식별자와 일치하지 않으면 상기 UE는 상기 602단계로 진행하여 상기 RNC(140)로부터 일정 주기로 재 전송되는 상기 PICH를 지속적으로 감시한다. If, unless the identifier of the paging message matches the identifier of the service to be received by the own, the UE continuously monitors the PICH proceeds to step 602 to be re-transmitted periodically from the RNC (140). 하지만, 상기 호출 메시지의 식별자가 자신이 수신하고자 하는 서비스의 식별자와 일치하면 상기 UE는 606단계로 진행한다. However, if the identifier of the paging message matches the identifier of the service to be received by the own, the UE proceeds to step 606. 상기 UE는 상기 606단계에서 Cell_FACH 상태로 천이한 후 상기 RNC(140)로부터 FACH를 통해 전송되는 모든 데이터를 수신한다. The UE then changes to the Cell_FACH state in step 606 receives all the data transmitted over the FACH from the RNC (140). 상기 UE는 607단계에서 상기 FACH를 통해 수신한 MBMS RB SETUP 메시지에 포함되어 있는 MBMS 무선 베어러 정보에 의거 2계층과 1 계층을 구성한 후 608단계에서 상기 MBMS 무선 베어러를 통해 상기 RNC(140)로부터 전송되는 MBMS 서비스에 의한 데이터를 수신한다. The UE sent in step 607 from the RNC (140) through the MBMS radio bearer in step 608. After configuring the first layer and second layer according to MBMS RB info included in the MBMS RB SETUP message received through the FACH It receives the data by the MBMS service. 한편, 상기 도 6에서는 상기 UE가 상기 FACH를 통해 MBMS RB SETUP 메시지를 수신하지 못하는 경우에 있어서의 동작에 대해서는 보이고 있지 않다. On the other hand, in the Figure 6 are not shown for the operation in the case where the UE does not receive the MBMS RB SETUP message on the FACH. 하지만, 상기 UE는 상기 606단계에서 원하는 MBMS RB SETUP 메시지가 수신되지 않으면 상기 602단계로 리턴한다. However, the UE does not receive the MBMS RB SETUP message desired in step 606 and returns to step 602. 그리고, 소정 주기(재 전송 주기)에 의해 상기 RNC(140)로부터 재 전송되는 PICH를 수신한 후 전술한 과정을 재 수행하게 된다. And, after receiving the PICH which is retransmitted from the RNC (140) by a predetermined period (re-transmission period) it is re-performed the above-described process. 도 7은 본 발명의 제1실시 예에 따라 RNC(140)가 수행하게 되는 동작의 제어 흐름을 도시한 도면이다. 7 is a view showing a control flow of an operation that it would take the RNC (140) according to a first embodiment of the present invention. 상기 도 7을 참조하면, RNC(140)는 701단계에서 SGSN으로부터 서비스 통보(MBMS RAB ASSIGNMENT REQUEST) 메시지를 수신한 후 702단계로 진행한다. Referring to FIG. 7, RNC (140) is from the SGSN in step 701 notifies (MBMS RAB ASSIGNMENT REQUEST) After receiving the message, the process proceeds to step 702. 상기 RNC(140)는 상기 702단계에서 상기 서비스 통보 메시지에 포함된 TMGI와 DRX 파라미터를 이용해서 PO와 PI를 산출한다. The RNC (140) calculates the PO and PI using the TMGI and DRX parameters included in the service notification message in step 702. 또한, 상기 RNC(140)는 703단계에서 상기 서비스 통보 메시지에 포함되어 있는 QoS 정보와 UE 명단을 이용하여, MBMS 무선 베어러를 설정할 셀들을 결정하고, 상기 각 셀 별로 MBMS 무선 베어러 정보를 결정한다. In addition, the RNC (140) by using the UE list and the QoS information included in the service notification message in step 703 and determines the cell to set MBMS RB, and determines MBMS RB information per each cell. 상기 RNC(140)는 704단계에서 상기 서비스 통보 메시지를 통해 상기 SGSN(130)으로부터 제공받은 임의의 재 전송 주기를 검사하기 위한 재 전송 타이머를 구동한다. The RNC (140) drives the re-transmission timer for checking the transmission period of any material received from the SGSN (130) through the service notification message in step 704. 상기 재 전송 주기의 검사는 UE로부터 응답 메시지를 수신하지 않는 대신에 MBMS 무선 베어러 설정을 위한 그룹 시그널링을 주기적으로 수행하기 위해 요구되는 것이다. Examination of the re-transmission period is required to perform the group signaling for MBMS RB setup, instead of periodically does not receive a response message from the UE. 한편, 상기 RNC(140)는 705단계에서 PICH, PCH 및 FACH를 통해 MBMS 무선 베어러 메시지를 전송하기 위한 일련의 동작을 수행한다. On the other hand, the RNC (140) performs a series of operations for transmitting a message via the MBMS RB PICH, PCH and FACH in step 705. 이때, 상기 PICH는 상기 산출한 PO의 PI가 'on'으로 설정되어 전송되며, TMGI가 포함된 호출 메시지는 상기 PCH를 통해 전송된다. Here, the PICH is transmitted by the PI of the PO output is set to 'on', the call message including the TMGI is transmitted via the PCH. 또한, 상기 FACH를 통해 전송되는 MBMS RB SETUP 메시지는 상기 결정한 MBMS 무선 베어러 정보를 포함한다. In addition, the MBMS RB SETUP message is transmitted over the FACH includes the determined MBMS RB information. 그 후 상기 RNC(140)는 706단계에서 앞서 구동한 재 전송 타이머를 통해 재 전송 주기가 도래하였는지를 검사한다. Then to the RNC (140) checks whether the re-transmission period arrives through the re-transmission timer previously driven at step 706. 상기 재 전송 주기가 도래하였다는 것은 재 전송 주기만큼의 시간이 경과하였다는 것으로서 상기 재 전송 타이머의 값이 '0'이 되었음을 의미한다. The re-transmission cycle was the advent means that the value of the retransmission timer "0" as was the time as the re-transmission period elapses. 혹은 구성에 따라 재전송 타이머가 일정 시간에 이르렀음을 의미할 수도 있다. Or it may mean that the retransmission timer has reached the predetermined time, depending on the configuration. 상기 재 전송 주기가 도래하면, 상기 RNC(140)는 상기 704단계로 진행하여 상기 재 전송 타이머를 재 구동하고, 상기 705단계로 진행하여 앞서 전송된 PICH, PCH 및 상기 MBMS RB SETUP 메시지를 전송하는 FACH 신호를 재 전송한다. If the arrival is the re-transmission period, the RNC (140) proceeds to the step 704 wherein the re-transmission timer and restart the, control proceeds to step 705 to transmit the PICH, PCH and the MBMS RB SETUP message sent earlier re-transmits the FACH signal. 상기 재 전송 주기(Repetition_Time)는 SGSN(130)이 MBMS 서비스의 종류에 따라 결정할 수 있으며, 적절한 결정 방법은 상황에 따라 가변적으로 적용될 수 있으므로, 본 발명에서는 명시하지 않는다. The re-transmission cycle (Repetition_Time) has SGSN (130) is be determined according to the kinds of MBMS services, since the proper decision method can be variably applied according to the circumstances, it does not specify the present invention. 하지만, 상기 재 전송 주기는 PICH가 전송된 후 MBMS RB SETUP 메시지를 포함하는 FACH가 전송되기까지의 소요되는 시간보다는 크고, 해당 MBMS 서비스가 지속되는 시간보다는 짧아야 한다. However, the re-transmission period is greater than the time it takes to the PICH is transmitted after the FACH includes the MBMS RB SETUP message transmission, and shorter than the time that the MBMS service is sustained. 그리고, 상기 RNC(140)는 상기 도 7에서는 보이고 있지 않으나 상기 PICH, PCH 및 FACH의 재 전송이 이루어지고 있다고 하더라도 정상적으로 MBMS 무선 베어러 설정이 완료된 UE들을 위해 해당 MBMS 서비스에 따른 데이터를 전송하여야 한다. In addition, the RNC (140) is to be normally transmitting data according to the MBMS service for the UE is MBMS radio bearer setup complete, if any, but not shown in the Fig. 7 the PICH, PCH, and re-transmission is made the FACH. 한편, 상기 RNC(140)는 707단계에서 해당 MBMS 서비스가 종료되는지를 지속적으로 검사한다. On the other hand, the RNC (140) is continuously checked whether the MBMS service is terminated in step 707. 만약, 해당 MBMS 서비스가 종료하였다면 상기 704단계 내지 706단계에 의해 수행되는 재 전송 과정이 불필요하게 될 것이다. If, If the MBMS service is terminated will be no need for re-transmission process performed by the step 704 to step 706. 전술한 바와 같이 본 발명의 제1실시 예에서는 상기 704단계 내지 상기 707단계를 통해 해당 MBMS 서비스가 종료될 때까지 PICH/PCH/FACH를 소정 재 전송 주기에 의해 반복하여 전송하도록 하고 있다. In the first embodiment of the present invention as described above and to transmit to the PICH / PCH / FACH until the corresponding MBMS service end through the step 704 to the step 707 repeated by the predetermined re-transmission period. 후술될 본 발명의 제2실시 예는, RNC(140)가 임의의 셀 내에 존재하는 UE들로부터 서비스가 요청된 MBMS 서비스들 각각의 현재 서비스 제공 여부를 알리는 정보를 셀 방송 서비스(CBS : Cell Broadcast Service)를 이용해서 셀 별로 주기적으로 방송한다. The second embodiment of the present invention to be described hereinafter is, RNC (140) that any existing UE in the service cell broadcast service information indicating the MBMS service to whether each of the current service providing request from that in the cell (CBS: Cell Broadcast using the Service) is periodically broadcast by each cell. 한편, UE는 상기 CBS를 통해 상기 정보를 수신하여 현재 셀 내에서 제공되고 있는 MBMS 서비스들 중 자신이 서비스 요청하였으나 해당 서비스를 제공받지 못하고 있으면 상기 RNC(140)로부터 개별적으로 MBMS 무선 베어러 정보를 재 전송 받기 위한 절차를 수행한다. On the other hand, UE is re If the receive information on their of the MBMS, which is available in the current cell, the service is not being provided the service, but the requested service MBMS RB information separately from the RNC (140) over the CBS and the procedure for obtaining transmission. 따라서, 특정 MBMS 서비스에 대응한 MBMS RB SETUP 메시지에 대한 응답 메시지를 상기 특정 MBMS 서비스를 요청한 모든 UE들이 개별적으로 전송하지 않고도, 상기 특정 MBMS 서비스가 이루어질 수 있도록 하는 방법을 제공한다. Accordingly, there is provided a method for all the UE requesting the particular MBMS service response message for the MBMS RB SETUP message corresponding to the specific MBMS service without the need to separately transmitted, to be made of the particular MBMS service. 도 8은 본 발명의 제2실시 예에 따른 멀티캐스트 멀티미디어 방송 서비스를 제공하기 위한 무선 베어러 설정과정을 신호 흐름으로써 보이고 있는 도면이다. 8 is a diagram illustrating by a radio bearer set-up process for providing a multicast broadcast multimedia service according to the second embodiment of the present invention, the signal flow. 상기 도 8에서 무선 베어러를 설정하기 위해 RNC(140)로부터 UE들로 최초 전송되는 모든 메시지들은 그룹 시그널링(Group Signaling)에 의해 전송된다. All messages in the FIG. 8 from the RNC (140) to establish a first radio bearer is transmitted to the UE are transmitted by a group signaling (Signaling Group). 상기 그룹 시그널링은 RNC(140)가 하나의 메시지를 복수의 대상(UE들 또는 셀들)으로 전송하는 신호 전송방식을 통칭한다. The group signaling is known as a signal transfer method of transferring the RNC (140) a message to a plurality of destination (UE or cells). 하지만, 무선 베어러 설정을 위해 RNC(140)와 UE들간에 전송되는 제어 메시지는 개별 시그널링에 의해 전송된다. However, the control message transmitted to the RNC (140) and between the UE to the radio bearer setup is transmitted by individual signaling. 상기 개별 시그널링은 RNC(140)와 특정 UE간에 이루어지는 신호 전송방식을 통칭한다. The individual signaling is known as the signal transmission system is between RNC (140) with a particular UE. 그리고, 후술될 설명에서 "UE들"이라는 용어는 동일한 셀 내에 존재하는 UE들로서 MBMS 서비스를 요청한 UE들을 지칭하는 의미로 사용되고 있다. Then, the description will be described later, the term "UE of" is used to mean to refer to a UE requesting the MBMS service as the UE which is present in the same cell. 또한, 후술될 설명에서는 ACTIVATE MBMS PDP CONTEXT REQUEST 메시지를 전송하고, ACTIVATE MBMS PDP CONTEXT ACCEPT 메시지를 수신함으로써 서비스 요청 과정이 완료된 UE들을 그 대상으로 하고 있다. Further, in the explanation which will be described later, and the UE a service request procedure by sending an MBMS PDP CONTEXT REQUEST message, ACTIVATE, MBMS PDP CONTEXT ACCEPT message, receiving the completed ACTIVATE the object. 상기 도 8을 참조하여 제2실시 예를 보다 구체적으로 살펴보면, MBMS 무선 베어러를 설정하기 위해 501단계 내지 505단계에서 수행되는 모든 일련의 절차들은 전술한 제1실시 예에서 도 5를 참조하여 설명한 바와 동일함에 따라 상세한 설명은 생략한다. Above with reference to Figure 8. Referring in more detail a second embodiment, all of a series of procedure performed in step 501 to step 505 to set up the MBMS RB are described with reference to five degrees in the first embodiment detailed Description as the same is omitted. 상기 설명을 생략한 절차에 의해 MBMS 무선 베어러의 설정에 성공한 UE들과 SGSN은 207단계에서 상기 MBMS 무선 베어러에 의한 MBMS 데이터의 송/수신을 수행한다. At the UE and the SGSN step 207 a successful setup of the MBMS RB by a process omitting the above description performs the transmission / reception of MBMS data by the MBMS RB. 하지만, 상기 MBMS 무선 베어러의 설정에 실패한 UE들을 위해서는 별도의 시그널링이 제안되고 있다. However, a separate signaling has been proposed to have failed in the UE setting of the MBMS radio bearer. 먼저, 상기 RNC(140)는 상기 MBMS 데이터를 전송하는 절차와 별도로 801단계, 805단계 및 806단계에서 MBMS 상태(MBMS STATUS) 메시지를 CBS(Cell Broadcast Service)를 이용해서, 주기적으로 전송한다. First, the RNC (140) is using the MBMS status (MBMS STATUS) CBS (Cell Broadcast Service) messages in a separate process with step 801, step 805 and step 806 for transmitting the MBMS data will be transmitted periodically. 상기 MBMS 상태 메시지는 셀 별로의 전송이 이루어지며, 각 셀 별로 요청된 MBMS 서비스들 중 이미 제공되는 있는 MBMS 서비스들을 동일 셀 내에 존재하는 UE들에게 알려주는 역할을 한다. The MBMS status message is made of the transfer of the cell-by-cell basis, and has a role to notify the UE existing in the same cell, the MBMS service is already provided of a MBMS service requested by each cell. 이에 대응하여 UE들은 상기 CBS를 통해 상기 RNC(140)로부터 전송되는 MBMS 상태 메시지를 수신하고, 상기 MBMS 상태 메시지에 의해 자신이 요청한 MBMS 서비스가 이미 셀 내에서 제공되고 있는 지를 판단한다. In response, UE must determine if the MBMS reception status message transmitted from the RNC (140) and, on their MBMS service requested by the MBMS status message that is already provided in the cell via the CBS. 만약, 셀 내에서 이미 제공되고 있는 MBMS 서비스들 중 자신이 요청한 MBMS 서비스가 존재하지 않으면 MBMS 무선 베어러 정보를 수신하기 위한 통상적인 절차를 지속적으로 수행한다. If you do not have the MBMS service requested his presence among the MBMS services that are already available within the cell continues to perform the normal procedures for receiving MBMS RB information. 하지만, 셀 내에서 이미 지원되고 있는 MBMS 서비스들 중 자신이 요청한 MBMS 서비스가 존재한다면 상기 UE는 이미 원하는 MBMS RB SETUP 메시지의 전송이 이루어졌으나 수신하지 못하였음을 인지하게 된다. However, if you become aware of an MBMS himself of the MBMS that is already requested support in the presence of cells hayeoteum not received, the UE has already sent a desired MBMS RB SETUP message been made. 상기 UE의 동작을 보다 구체적으로 설명하면, 임의의 UE는 서비스 요청 과정을 완료한 MBMS 서비스의 식별자(SERVICE ID)를 MBMS_SERVICE_JOINED라는 변수에 저장한다. The operation of the UE in more detail, any of the UE stores the identifier (SERVICE ID) of the MBMS service is complete a service request process in a variable named MBMS_SERVICE_JOINED. 만약, 상기 505단계에서 MBMS RB SETUP 메시지를 정상적으로 수신하여 MBMS 서비스를 시작하였다면 상기 MBMS_SERVICE_JOINED에 저장되어 있는 해당 식별자(SERVICE ID)를 삭제하고, 상기 식별자(SERVICE ID)를 MBMS_SERVICE_ONGOING 변수에 저장한다. If and If in the step 505 by receiving a normal MBMS RB SETUP message, MBMS services start to delete the identifier (SERVICE ID) stored in the MBMS_SERVICE_JOINED, and stores the identifier (ID SERVICE) on MBMS_SERVICE_ONGOING variable. 상기 MBMS_SERVICE_JOINED라는 변수에 하나 이상의 식별자(SERVICE ID)들을 저장하고 있는 UE는 CBS를 통해 전송되는 MBMS 상태 메시지를 수신한다. UE, which store one or more identifier (SERVICE ID) in that the variable MBMS_SERVICE_JOINED receives the MBMS status message sent on the CBS. 그리고, 상기 MBMS_SERVICE_JOINED에 저장되어 있는 식별자(SERVICE ID)와 상기 수신한 MBMS 상태 메시지에 포함되어 있는 식별자(SERVICE ID)들을 비교한다. And, compares the identifier (ID SERVICE) contained in the MBMS status message with the received identifier (SERVICE ID) stored in the MBMS_SERVICE_JOINED. 상기 비교 결과 상기 MBMS_SERVICE_JOINED에 저장되어 있는 식별자(SERVICE ID)와 일치하는 ID가 존재하면, 해당 UE는 802단계로 진행하여 상기 식별자(SERVICE ID)를 포함하는 MBMS 무선 베어러 정보 재 전송 요청(MBMS RB info RTX REQ) 메시지를 개별 시그널링을 통해 상기 RNC(140)로 전송한다. If the ID that matches the identifier (SERVICE ID) that the comparison result is stored in the MBMS_SERVICE_JOINED exists, the UE proceeds to step 802, MBMS radio bearer information retransmission request containing the identifier (SERVICE ID) (MBMS RB info It transmits an RTX REQ) message to the RNC (140) through separate signaling. 상기 MBMS 무선 베어러 정보 재 전송 요청(MBMS RB info RTX REQ) 메시지는 "MBMS RB info RTX REQUEST = [Message Type, UE ID, SERVICE ID]"의 정보를 포함한다. And the MBMS radio bearer information retransmission request (MBMS RB info RTX REQ) message includes information of the "MBMS RB info RTX REQUEST = [Message Type, UE ID, SERVICE ID]". 상기 RNC(140)는 상기 MBMS RB info RTX REQ 메시지를 수신하면, 상기 MBMS RB info RTX REQ 메시지에 포함된 식별자(SERVICE ID)를 확인한다. The RNC (140) when it receives a RB info RTX REQ message, the MBMS, and checks the identifier (ID SERVICE) contained in the message MBMS RB info RTX REQ. 그리고, 상기 확인된 식별자에 대응하는 MBMS 서비스의 MBMS 무선 베어러 정보를 포함하도록 MBMS RB SETUP 메시지를 구성한다. Then, the configuration of MBMS RB SETUP message to include MBMS radio bearer information for the MBMS service corresponding to the identified ID. 상기 MBMS RB SETUP 메시지는 803단계에서 FACH를 통해 상기 재 전송을 요청한 UE로 전송된다. The MBMS RB SETUP message is transmitted to the UE requesting the re-transmitted over the FACH in step 803. 즉, 상기 재 전송되는 MBMS RB SETUP 메시지는 개별 시그널링(개별 메시지)에 의해 전송됨에 따라 다른 UE들로는 전송되지 않는다.이를 위해 상기 MBMS RB SETUP 메시지는 UE의 개별 식별자인 RNTI(Radio Network Temporary Identity)를 포함한다. That is, MBMS RB SETUP message is the re-transmission is not transmitted include another UE as sent by the individual signaling (individual messages) to a RNTI (Radio Network Temporary Identity), the MBMS RB SETUP message to the individual identifier of the UE for this purpose It includes. 즉, 본 발명의 제2실시 예에서는 UE들로부터 MBMS 서비스에 대한 무선 베어러(Radio Bearer) 정보에 대한 응답 메시지를 받지 않는 대신에, CBS를 통해 현재 제공되는 MBMS 서비스의 정보를 지속적으로 알려주고, 상기 UE로 하여금 CBS로부터 송신되는 메시지를 통해서 자신이 현재 MBMS 무선 베어러에 대한 정보를 수신하였는지 못하였는지 여부를 판단하게 한다. That is, the second embodiment of the present invention, in place of that from the UE receives the response message for the radio bearer (Radio Bearer) information for the MBMS service, notifies the information of the MBMS service currently provided via the CBS to continue the It allows the UE determines whether or not to make sure that his through the message sent from the CBS receives information about the current MBMS RB. 만약, 수신하지 못하였을 경우 RNC로 요청함으로써, 상기 RNC는 MBMS 무선 베어러에 대한 정보를 수신 받지 못한 UE에게만 개별적으로 무선 베어러에 대한 정보를 전송하게끔 하는 것이다. If, When the wrong not received by request to the RNC, the RNC is to hagekkeum transmits the information on the radio bearer separately only to UE did not receive reception information about the MBMS RB. 여기서, 상기 CBS에서 현재 UE로 하여금 무선 베어러에 대한 정보의 수신여부를 알게끔 하기 위한 방법으로 MBMS 서비스에 대한 정보를 주는 것으로 설명하고 있으나, 이는 여러 가지 형태로 변형 가능함은 물론이다. Here, let the current UE by the CBS but are described as giving information about the MBMS service as a way to gekkeum know whether or not to receive the information on the radio bearer, which is a possible variant, as well as in various forms. 상기 UE는 개별 시그널링을 통해 상기 RNC(140)로부터 상기 MBMS RB SETUP 메시지를 수신하고, 804단계에서는 상기 MBMS RB SETUP 메시지에 대한 응답으로 MBMS 무선 베어러 셋업 완료(RB SETUP COMPLETE) 메시지를 상기 RNC(140)로 전송한다. The UE said to receive the MBMS RB SETUP message from the RNC (140) and, at step 804 in response to the MBMS RB SETUP message, MBMS radio bearer setup completion (RB SETUP COMPLETE) message via a separate signaling RNC (140 ) and transmits it to. 상기 MBMS RB SETUP COMPLETE 메시지는 랜덤 접근채널(RACH)을 통해 전송됨에 따라 상기 UE를 구분하기 위한 개별 식별자인 RNTI를 포함한다. RB SETUP COMPLETE message to the MBMS includes an individual identifier, RNTI to identify the UE as sent on the random access channel (RACH). 상기 개별 메시지(individual signaling)는 집단 메시지(group signaling)에 대비되는 용어로, 송신장치와 수신장치가 단수인 경우를 지칭한다. The respective message (signaling individual) refers to the case of the term, as opposed to the group of messages (signaling group), the transmitting apparatus and the receiving apparatus is singular. 즉, 상기 505단계에서 전송이 이루어지는 MBMS RB SETUP 메시지는 송신장치는 단수이지만 수신장치는 특정 MBMS 서비스를 수신하고자 하는 복수의 UE들인 집단 메시지의 예라 할 수 있다. That is, MBMS RB SETUP message is transmitted transmission unit is made in the step 505 is a singular, but the receiving device can examples of group messages, which are a plurality of UE desiring to receive a specific MBMS service. 본 발명의 제2실시 예에서 새로이 제안되고 있는 MBMS 상태 메시지는 CBS의 스케줄 상황에 따라 반복 전송된다(801단계, 805단계, 806단계). MBMS status message that is being newly proposed in the second embodiment of the present invention is repeatedly transmitted according to CBS scheduling situation (step 801, step 805, step 806). 상기 스케줄 상황은 CBS 스케줄 메시지를 통해 UE들에게 공지됨에 따라 UE들은 상기 CBS 스케줄 메시지의 정보를 바탕으로 MBMS 상태 메시지만을 수신할 수 있다. The schedule condition can only receive MBMS status messages to the UE are based on the information in the CBS schedule message as known to the UE via the CBS schedule message. 전술한 바와 같이 본 발명의 제2실시 예에서는 RNC에서 셀 별로 현재 제공되는 있는 MBMS 서비스들의 정보를 제공함으로써 최초 MBMS RB SETUP 메시지의 수신에 실패한 UE들이 상기 RNC와의 개별적인 메시지 교환을 통해, 원하는 MBMS 무선 베어러 정보를 인지하도록 하였다. Through the present invention the second embodiment, the UE fails to receive the first MBMS RB SETUP message to the individual messages exchanged between the RNC providing the information of the MBMS service that is currently provided by each cell in the RNC of the steps described above, the desired MBMS radio It was to recognize the bearer information. 따라서, MBMS RB SETUP 메시지에 대응하여 UE들 각각이 응답 메시지를 전송하지 않더라도 정상적인 MBMS 서비스가 이루어질 수 있다. Therefore, UE, respectively in response to the MBMS RB SETUP message without sending a response message may be a normal MBMS service. 도 9는 본 발명의 제2실시 예를 구현함에 있어 요구되는 스케줄 메시지 구조의 일 예를 도시하고 있는 도면이다. 9 is a drawing illustrating an example of a schedule message required structure in implementing the second embodiment of the present invention. 상기 도 9를 참조하면, 스케줄 메시지는 MBMS 상태 메시지의 전송 스케줄에 관한 정보를 셀 별로 제공하기 위한 메시지이다. Referring to FIG. 9, the schedule message is a message for providing information about a transmission schedule of the MBMS status message for each cell. 상기 스케줄 메시지는 각 셀 내의 UE들로 전달된다. The schedule message is delivered to the UE in each cell. 즉, 상기 스케줄 메시지는 RNC가 셀 별로 구성하여 해당 셀 별로 방송한다. In other words, the schedule message to RNC is configured for each cell to broadcast by the cell. 상기 스케줄 메시지는 한 스케줄링 주기(scheduling period) 동안 전송될 데이터들에 대한 정보를 담고 있다. The schedule message contains information on data to be transmitted during a scheduling period (scheduling period). 상기 스케줄링 주기(Scheduling period)는 다수의 공통전송채널 블록 셋(CTCH BS : Common Transport Channel Block Set)들로 구성되며, 상기 CTCH BS의 크기는 복수의 라디오 프레임으로 규정된다. The scheduling period (Scheduling period) includes a plurality of common transport channel block set: consists of (CTCH BS Common Transport Channel Block Set), the CTCH BS size is defined by a plurality of radio frames. 또한, 상기 스케줄 메시지를 통해 전송되는 정보들은 상위계층 신호로써 사전에 UE와 RNC가 공유하여야 하는 정보이다. Further, the information transmitted through the scheduling message are information to be shared by the UE and the RNC in advance as the upper-layer signal. 도 11은 본 발명의 제2실시 예에서 스케줄링 메시지와 함께 스케줄링 주기 동안 CTCH BS들이 전송되는 예를 보이고 있는 도면이다. Figure 11 is a diagram illustrating an example of CTCH BS that transmitted during a scheduling period with a scheduling message in the second embodiment of the present invention. 상기 도 11에서 보는 바와 같이 하나의 스케줄링 주기(scheduling period)(1106)는 스케줄 메시지(1101)에 의해서 공지된 CBS 스케줄링 주기의 길이(length of CBS scheduling period)(904) 만큼의 CTCH BS들로 구성된다. Wherein, as shown in Figure 11 a scheduled period (scheduling period) (1106) of is made up of CTCH BS in as much as the length (length of CBS scheduling period) of the CBS scheduling period (904) known by the schedule message 1101 do. 상기 스케줄링 주기(Scheduling period)의 시작점은 상기 스케줄 메시지(1101)로부터 소정 옵셋(Offset to Begin CTCH BS)(1103) 만큼 이격된다. Starting point of the scheduling period (Scheduling period) are spaced apart by a predetermined offset (Offset to Begin CTCH BS) (1103) from the schedule message 1101. 각 CTCH BS들에 대한 설명은 상기 도 9에서 보이고 있는 스케줄 메시지의 메시지 디스크립션(message description)들(906 ~ 907)에 의해서 주어진다. Description of each CTCH BS is given by the (906-907) a description message (message description) of the schedule message illustrated in FIG. 9. 상기 메시지 디스크립션(message description) 하나는 CTCH BS 하나와 대응되며, 상기 메시지 디스크립션(message description)은 대응되는 CTCH BS에 대한 Message Description Type 정보를 포함한다. One said description messages (message description) will be compatible with a CTCH BS, the message description (description message) includes a Message Description Type information on the CTCH BS corresponding. 상기 Message Description Type 정보는 해당 CTCH BS의 성격을 규정하는, 미리 결정된 값들이다. The Message Description Type is information are, to a predetermined value for defining the nature of the CTCH BS. 본 발명에서는 상기 Message Description Type 정보들 중 사용하지 않는 값인 '9'를 MBMS 상태 메시지와 대응시킨다. In the present invention thus corresponds to the "9" value that does not use one of the Message Description Type information and the MBMS status message. 상기 옵셋(Offset to Begin CTCH BS)의 정보 요소(Information Element)(903)는 상기 도 9에서 보는 바와 같이 8 비트 크기를 가지며, 1 ~ 255 사이의 값을 표현한다. The offset IE (Information Element) (903) of the (Offset to Begin CTCH BS) has a size of 8 bits as shown in FIG. 9, which represents a value between 1 and 255. 상기 CBS 스케줄링 주기의 길이(length of CBS scheduling period) (904)의 정보 요소 역시 8 비트 크기를 가지며, 0 ~ 255 사이의 값을 표현한다. Has the 8-bit information element is also the size of the length (length of CBS scheduling period) (904) of the CBS schedule period and represents a value from 0 to 255. 본 발명의 제2실시 예를 지원하는 UE들은 상기 스케줄 메시지(1101)를 수신하면, 상기 스케줄 메시지에 포함되어 있는 상기 옵셋(903) 정보와 상기 CBS 스케줄링 주기의 길이(904) 정보를 이용하여 상기 스케줄링 주기의 시작 시점과 종료 시점을 인지할 수 있다. If the UE that supports the second embodiment of the present invention receives the schedule message 1101, wherein by using the offset 903 is information with length 904 information in the CBS schedule period that is included in the schedule message It can recognize the start and end of the scheduled period. 또한, 상기 스케줄 메시지에 포함되어 있는 메시지 디스크립션(message description)들(906 ~ 907)의 Message Description Type 정보를 판독하여 상기 정보가 9인 CTCH BS의 위치를 확인할 수 있다. Further, it is possible to read the information in the message Message Description Type description (description message) to (906-907) included in the scheduling message to determine the location of a CTCH BS that the information 9. 또한, 상기 Message Description Type 정보가 9인 CTCH BS만 선별적으로 수신할 수 있다. In addition, the Message Description Type of CTCH BS information 90,000 can receive a selective basis. 이하 상기 스케줄 메시지(1101)의 구조에 대해서 간략히 설명하면, 상기 스케줄 메시지의 Message Type은''2'로 정의되어 있다. A brief description will be given below on the structure of the schedule message (1101), Message Type of the schedule message is defined as "2". 그리고 새로운 메시지 비트맵(New message bitmap)(905)은 각 CTCH BS가 새로운 메시지(new message)인지, 예전에 전송된 적이 있는 메시지(old message)인지를 알려주는 값들이다. And it is telling whether the new message bitmap (New message bitmap) (905) are each CTCH BS new messages (new message) whether, had sent a message to the old (old message) that has value. 상기 새로운 메시지 비트맵의 크기는 한 스케줄링 주기(Scheduling period) 동안에 전송되는 CTCH BS의 개수에 따라 가변적이다. The size of the new message bit map is variable according to the number of CTCH BS that is transmitted during the scheduling period (Scheduling period). 예컨대, 상기 새로운 메시지 비트맵이 '0'으로 설정된 CTCH BS로는 예전에 전송된 적이 있는 메시지(old message)가 전송되고, '1'로 설정된 CTCH BS로는 새로운 메시지(new message)가 전송된다. For example, the CTCH BS roneun the new message bitmap is set to '0', the transmission of the message have the (old message) transmitted in the past, roneun CTCH BS is set to "1" is transmitted, a new message (new message). 한편, 상기 도 11에서 설명한 바와 같이, UE들은 스케줄 메시지(Schedule message)를 수신하여 MBMS 상태 메시지가 전송될 CTCH BS를 확인하고, 상기 CTCH BS를 선별적으로 수신할 수 있다. On the other hand, as illustrated in FIG 11, UE may receive a scheduling message (Schedule message) to determine the CTCH BS be a MBMS transmission status message, and receive the CTCH BS selectively. 도 10은 본 발명의 제2실시 예를 구현함에 있어 요구되는 MBMS 상태 메시지 구조의 일 예를 도시하고 있는 도면이다. 10 is a drawing illustrating an example of the MBMS status message structure is required in implementing a second embodiment of the present invention. 상기 도 10에서 일 예로서 도시되고 있는 MBMS 상태 메시지의 구조는 통상적인 CBS 메시지의 구조와 동일하다. The way of example in Figure 10 the structure of which is shown MBMS status message is the same as that of a typical CBS message. 상기 10을 참조하면, MBMS 상태 메시지를 구성하는 Message Type(1051)의 값은 현재 사용되지 않는 '4'로 정의한다. Referring to 10, the value of the Message Type (1051) constituting the MBMS status message is defined as "4" are not currently being used. 메시지 식별자(Message ID)(1052)는 CBS 메시지의 식별자 역할을 하며, 통상적으로 UE는 상기 메시지 식별자(Message ID)를 이용하여 임의의 CBS 메시지 수신 여부를 결정할 수 있다. Message Identifier (Message ID) (1052) and is the identifiers of the CBS message, typically a UE may determine whether or not to receive any of the CBS message using the message ID (Message ID). 그러나 본 발명에서 UE는 Message Type을 이용해서 MBMS 상태 메시지임을 식별하므로, 상기 메시지 식별자(Message ID)의 실제적인 효용성은 존재하지 않는다. However, in the present invention because it is used by UE to identify that the MBMS status message Message Type, the actual effectiveness of the message ID (Message ID) is not present. 한편, RNC는 상기 메시지 식별자(Message ID) 값을 기 정의되어 있지 않은 값으로 설정하여 상기 MBMS 상태 메시지를 전송하고, 상기 UE는 상기 메시지 식별자(Message ID) 값을 저장한다. On the other hand, the RNC the UE by setting a value that is not defined the value of the message group ID (Message ID) transmits the MBMS status message, stores the message ID (Message ID) value. 시리얼 넘버(Serial Number)(1053)는 임의의 동일한 메시지가 담고 있는 내용의 갱신 여부를 나타낼 수 있는 값으로 16 비트로 구성된다. Serial number (Serial Number) (1053) consists of 16 bits to a value that can indicate whether updating of the information in any of the same message contains. 상기 동일한 메시지는 동일한 메시지 식별자(message ID)를 가지는 CBS 메시지를 의미한다. The same message means a CBS message having the same message identifier (message ID). 본 발명에서는 도 8에서의 805단계와 806단계처럼, 임의의 MBMS 서비스가 해당 셀에서 추가되거나, 종료되어서 MBMS 상태 메시지의 내용이 변할 경우 상기 시리얼 넘버(Serial number)를 변화시킨다. The present invention, as in step 806 and step 805 in Figure 8, the particular MBMS service is added in the cell, or, if the termination be changed, the contents of the MBMS status messages, changes the serial number (Serial number). 데이터 코딩 기법(Data Coding Scheme)(1054)은 CBS 메시지의 페이로드(payload)에 적용된 언어를 나타내는 값이며, 3GPP TS 23.081에 정의되어 있다. The data coding scheme (Data Coding Scheme) (1054) is a value that indicates the language applied to the payload (payload) of the CBS message, as defined in 3GPP TS 23.081. 본 발명에서는 상기 데이터 코딩 기법 필드(1054)는 아무런 효용성을 가지지 않는다. In the present invention, the data coding scheme field 1054 does not have any utility. 하지만, 기존 방식과의 호환성을 유지하기 위해 상기 3GPP TS 23.081에서 사용되지 않고 있는 임의의 값을 상기 데이터 코딩 기법 필드(1054) 값으로 정의한다. However, it defines a random value that is not used in the 3GPP TS 23.081 to the data coding scheme field (1054) value in order to maintain compatibility with the conventional method. MBMS 상태 데이터(1055)는 상기 MBMS 상태 메시지의 페이로드(payload)이며, 상기 MBMS 상태 메시지를 전송하는 현재 시점에 해당 셀에서 제공되고 있는 MBMS 서비스의 ID들(1056 ~ 1058)로 구성된다. MBMS status data 1055 is the MBMS, and a payload (payload) of the status message, is composed of the ID (1056-1058) of the MBMS service that is provided by the cell to the current point in time for transmitting the MBMS status message. 상기 SERVICE ID로 IPV6 주소가 사용된다면, 상기 SERVICE ID 필드들(1056 ~ 1058)의 크기는 128 비트이다. If the IPV6 address used by the SERVICE ID, the size of the ID field, the SERVICE (1056-1058) is a 128-bit. 도 12는 본 발명의 제2실시 예에 따라 UE가 수행하게 되는 동작의 제어 흐름을 도시한 도면이다. 12 is a view showing a control flow of an operation that the UE is performed according to a second embodiment of the present invention. 상기 도 12에서 보이고 있는 제어 흐름에 의한 동작은 특정 MBMS 서비스를 요청한 UE를 대상으로 하여 제안하고 있으며, 후술될 상세한 설명에서도 UE가 특정 MBMS 서비스를 요청한 것을 가정하여 설명하고 있음에 유의해야 한다. Operation according to the control flow illustrated in FIG 12 is proposing to the target UE a request for a particular MBMS service, in the detailed description which will be described later, the UE should be noted that the explanation on the assumption that requested a particular MBMS service. 상기 도 12를 참조하면, UE는 특정 MBMS 서비스를 요청한 후 1201단계에서 MBMS_SERVICE_JOINED 변수를 비우고, 1202단계에서 상기 MBMS_SERVICE_JOINED 변수에 저장되어 있는 항목의 갱신으로 인해 하나 이상의 변수들이 존재하면 1203단계로 진행한다. Referring to FIG. 12, UE when emptied MBMS_SERVICE_JOINED variables in step 1201. After requesting a specific MBMS service, the presence in the step 1202 are one due to an update or more variables of the item stored in the MBMS_SERVICE_JOINED variable proceeds to 1203 steps. 상기 1203단계로 진행하면 상기 UE는 셀 단위로 공지되는 시스템 정보를 통해, CBS가 서비스되는 제2공통제어물리채널(S-CCPCH : Secondary-Common Control Physical Channel)을 확인한다. Proceeding to the step 1203, the UE a second common control physical channel (S-CCPCH: Secondary-Common Control Physical Channel) through which the system information is known a cell unit, CBS service confirms. 그리고, 상기 채널을 통해 CBS 메시지들을 수신하면, 상기 CBS 메시지들 각각의 Message type 필드에 설정되어 있는 값을 검사한다. Then, when receiving the CBS message over the channel, it determines a value which is set in each of the Message type field of the CBS message. 만약, 상기 Message type 필드에 해당 CBS 메시지가 스케줄 메시지임을 나타내는 '2'가 설정되어 있다면 상기 UE는 1204단계로 진행한다. If there is the CBS message to the Message type field schedule message is '2' is set to indicate that the UE proceeds to step 1204. 상기 UE는 1204단계에서 상기 도 8과 상기 도 9에서 설명한 바와 같이, 다음 스케줄링 주기(scheduling period)를 구하고, 1205단계에서 상기 스케줄링 구간 동안 MBMS 상태 메시지가 있는지 판단한다. The UE as in step 1204 described with reference to FIG. 8 and FIG. 9, to obtain the next scheduling period (scheduling period), it is determined that the MBMS status message for the scheduling period in step 1205. 상기 판단은 스케줄링 메시지(scheduling message)의 message description type이 '9'인 메시지 디스크립션(message description)의 존재 여부를 근거로 이루어진다. The determination is made based on the presence or absence of the scheduling message, message description type is '9' message description (description message) of (scheduling message). 만약, MBMS 상태 메시지가 존재한다고 판단되는 경우, 상기 UE는 1206단계로 진행하여 상기 메시지 디스크립션(message description)에 해당하는 CTCH BS를 통해 전송되는 MBMS 상태 메시지를 수신한다. If, when it is determined that the MBMS status message exists, the UE receives the MBMS status message is sent the process proceeds to step 1206 through a CTCH BS corresponding to the description message (message description). 하지만, 다음 스케줄링 주기(Scheduling period) 동안 MBMS 상태 메시지가 존재하지 않는다고 판단되면, 상기 UE는 상기 1203단계로 진행하여 다음 스케줄 메시지(schedule message)가 도착할 때까지 대기한다. However, if it is determined that there is no MBMS following status messages are present during the scheduling period (Scheduling period), the UE waits until the next scheduling message (schedule message) to get the process proceeds to the step 1203. 한편, 상기 UE는 1207단계에서 상기 수신한 MBMS 상태 메시지에 MBMS_SERVICE_JOINED에 저장되어 있는 SERVICE ID와 동일한 SERVICE ID가 포함되어 있는 지를 판단한다. On the other hand, the UE determines whether that contain the same ID and SERVICE SERVICE ID is stored in MBMS_SERVICE_JOINED in the received MBMS status message in step 1207. 만약, 상기 MBMS 메시지가 상기 MBMS_SERVICE_JOINED에 저장되어 있는 SERVICE ID를 포함하고 있다면 상기 UE는 자신이 요청한 MBMS 서비스에 대응하여 RNC로부터 전송된 MBMS RB SETUP 메시지를 수신하지 못하였음을 인정한다. If there is the MBMS message includes SERVICE ID stored in the MBMS_SERVICE_JOINED, the UE recognizes that it has not received the MBMS RB SETUP message sent from the RNC to request their response to the MBMS service. 그리고, 상기 UE는 1208단계로 진행하여 원하는 MBMS RB SETUP 메시지의 재 전송을 요청하는 MBMS RB info RTX REQ 메시지를 상기 RNC로 전송한다. And, the UE transmits an MBMS RB info RTX REQ message to request re-transmission of the desired MBMS RB SETUP message, the process proceeds to step 1208 to the RNC. 상기 MBMS RB info RTX REQ 메시지는 DCCH를 통해 전송될 수 있으며, SERVICE ID와 UE의 개별 식별자가 포함된다. The RB info RTX REQ message may MBMS can be transmitted via a DCCH, it is included in the individual identifier SERVICE ID and the UE. 한편, 상기 UE는 상기 MBMS RB info RTX REQ 메시지를 전송한 후 1209단계에서 상기 RNC로부터 재전송되는 MBMS RB SETUP 메시지를 수신한다. On the other hand, the UE receives the MBMS RB SETUP message is retransmitted from the RNC in step 1209 and then transmits the MBMS RB info RTX REQ message. 상기 MBMS RB SETUP 메시지를 수신하면 상기 UE는 1210단계로 진행하여 상기 MBMS RB SETUP 메시지에 포함된 MBMS 무선 베어러 정보에 의해 각 계층을 설정한다. Upon receipt of the MBMS RB SETUP message, the UE sets the respective layer by the MBMS RB information includes the process advances to Step 1210 in the MBMS RB SETUP message. 그리고, 상기 설정에 의해 원하는 MBMS 서비스에 따른 MBMS 데이터를 수신하기 위한 준비를 완료한 뒤 상기 MBMS 데이터의 수신을 시작한다. Then, after completing the preparation for receiving the MBMS data in accordance with the desired MBMS service by setting the start of the reception of the MBMS data. 상기 1209단계에서 수신하는 MBMS RB SETUP 메시지는 개별 메시지(individual signaling)로 전송된다. MBMS RB SETUP message received in the step 1209 is sent as a separate message (individual signaling). 한편, 상기 UE는 1210단계에서 원하는 MBMS 서비스에 따른 MBMS 데이터의 수신이 시작되면 상기 MBMS 데이터의 수신이 시작된 해당 MBMS 서비스의 SERVICE ID를 상기 MBMS_SERVICE_JOINED 변수에서 제거한다. On the other hand, when the UE is removed from the reception of MBMS data is started to the SERVICE ID of a corresponding MBMS service receives the MBMS data is started MBMS_SERVICE_JOINED variable according to the desired MBMS service in step 1210. 그리고, 상기 MBMS_SERVICE_JOINED 변수에 저장되어 있는 남은 항목이 존재하는지를 1211단계에서 판단한다. Then, it is determined in step 1211 whether the remaining items that are stored in the variable MBMS_SERVICE_JOINED present. 만약, 남은 항목이 존재하면 상기 1203단계로 진행하여 다음 스케줄 메시지(schedule message)를 수신한 후 전술한 동작을 반복하여 수행한다. If, when the remaining items exist is performed by repeating the above-described operation after receiving the next scheduling message (message schedule) the process proceeds to the step 1203. 하지만, 상기 1211단계에서 상기 MBMS_SERVICE_JOINED 변수에 저장된 항목이 존재하지 않으면, 상기 1201단계로 진행하여 상기 MBMS_SERVICE_JOINED 변수로서 새로운 항목이 추가될 때까지 대기한다. However, unless the items stored in the MBMS_SERVICE_JOINED variable exists in the step 1211, and waits until the process proceeds to the step 1201 to be added, a new entry as the MBMS_SERVICE_JOINED variable. 도 13은 본 발명의 제2실시 예에 따라 RNC가 수행하게 되는 동작의 제어 흐름을 도시한 도면이다. 13 is a view showing a control flow of an operation that the RNC is performed in accordance with a second embodiment of the present invention. 상기 도 13을 참조하면, RNC는 현재 해당 셀에서 제공되고 있는 되는 MBMS 서비스들의 SERVICE ID들을 MBMS_STATUS_DATA라는 변수에 저장한다. Referring to FIG 13, the RNC stores the MBMS SERVICE ID of the service that is currently being supplied by the cell in a variable named MBMS_STATUS_DATA. 따라서, 상기 RNC는 1301단계에서 새로운 서비스에 대한 MBMS RAB ASSIGNMENT RESPONSE 메시지를 전송하거나 1302단계에서 기존 MBMS 서비스의 중단을 지시하는 MBMS RAB RELEASE 메시지를 전송한 후 1303단계로 진행한다. Thus, the RNC proceeds to after transmitting the MBMS RAB RELEASE message indicating the interruption of an existing MBMS service transmission in step 1302 or an MBMS RAB ASSIGNMENT RESPONSE message for a new service in a step 1301. Step 1303. 상기 1303단계로 진행한 상기 RNC는 상기 새롭게 시작되거나 중단된 서비스들의 SERVICE ID들을 상기 MBMS_STATUS_DATA에 갱신한다. By the RNC proceeds to the step 1303 is the start or update the new SERVICE ID of the service interruption in the MBMS_STATUS_DATA. 그 후 상기 RNC는 1304단계에서 다음 스케줄링 주기(scheduling period) 동안 전송할 CBS 메시지들을 셀 별로 스케줄링한 후 1305단계로 진행하여 다음 스케줄링 주기(scheduling period) 동안 MBMS 상태 메시지를 전송하기로 하였는지를 판단한다. After that, the RNC and then the CBS message to be transmitted for the next scheduling period (scheduling period) in step 1304 each cell scheduling control proceeds to step 1305 and determines whether to transmit the MBMS status message for the next scheduling period (scheduling period). 만약, 다음 스케줄링 주기(scheduling period) 동안 MBMS 상태 메시지를 전송하기로 하였다면 1306단계로 분기하고, 그렇지 않을 경우 상기 1304단계로 분 기한다. If, if the MBMS by transmitting a status message for the next scheduling period (scheduling period) and group branches to step 1306, otherwise step 1304 if the minute. 상기 1304단계로 분기하게 되면 상기 RNC는 차기 스케줄링 주기(scheduling period)의 스케줄링 동작까지 대기한다. When branches to the step 1304, the RNC waits until scheduling operation of the scheduling period next (scheduling period). 하지만, 상기 1306단계로 분기하면 상기 RNC는 MBMS 상태 메시지가 전송될 CTCH BS에 대응되는 message description 부분들의 MDT(Message Description Type)을 '9'로 설정한다. However, if a branch to the step 1306, the RNC to MDT (Message Type Description) of the message description part corresponding to a CTCH BS is the MBMS transmission status message is set to '9'. 그리고, 1307단계로 진행하여 스케줄 메시지를 전송한다. Then, the process proceeds to step 1307 and transmits a schedule message. 또한, 상기 RNC는 1308단계에서 상기 MBMS 상태 메시지를 구성함에 있어서, Message Type을 '4'로 설정하고, 1309단계에서는 Message ID를 미리 결정되어 있는 값으로 설정한다. In addition, the RNC in step 1308, as in the configuration of the MBMS status message, and sets the Message Type as "4", and step 1309 set to a value that is determined in advance for Message ID. 1310단계에서는 serial number를 적절히 설정하고, 1311단계에서는 MBMS 상태 데이터 부분에 MBMS_STATUS_DATA 변수에 저장되어 있는 SERVICE ID들을 삽입한다. In step 1310, the setting of the serial number and, in step 1311 and inserts the SERVICE ID is stored in the variable MBMS_STATUS_DATA MBMS status data portion. 상기 1310단계에서 상기 RNC는 상기 1311단계에 삽입하는 MBMS 상태 데이터가 이전에 전송한 MBMS 상태 데이터와 다를 경우 이전에 사용한 serial number와 다른 값을 사용하며, 같을 경우에는 같은 값을 사용한다. In the step 1310, the RNC uses the same value as in the case, it uses the same serial number, and other values ​​used in the previous state, if MBMS data to insert in the step 1311 is different from the MBMS status data previously transmitted. 이 후 상기 RNC는 1312단계에서 상기 MBMS 상태 메시지가 전송되어야 할 시점이 되면, 상기 MBMS 상태 메시지를 전송한 후 상기 1304단계로 진행한다. Thereafter, the RNC when the point to be the MBMS status messages are sent in step 1312, the process advances to the step 1304. After transmitting the MBMS status message. 한편 본 발명의 상세한 설명에서는 구체적인 실시예에 관해 설명하였으나, 본 발명의 범위에서 벗어나지 않는 한도내에서 여러 가지 변형이 가능함은 물론이다. While the invention has been shown and described with reference to certain preferred embodiments thereof, various modifications are possible within the limits that do not depart from the scope of the invention. 그러므로 본 발명의 범위는 설명된 실시예에 국한되어 정해져서는 안되며 후술하는 특허청구의 범위뿐만 아니라 이 특허청구의 범위와 균등한 것들에 의해 정해져야 한다. While the invention has been limited to the described embodiments jeonghaejyeoseo shall be defined by the scope and equivalents of the things that the appended claims as well as the claims, which must not be described later. 상술한 바와 같은 본 발명은, MBMS 서비스를 제공하는 이동통신시스템에서 특정 MBMS 서비스를 위해 요구되는 MBMS 무선 베어러 설정을 위한 MBMS 무선 베어러 셋업 메시지에 대응하여 UE들이 응답 메시지를 전송하지 않도록 함으로써 무선 자원의 효율을 배가시킬 수 있는 효과를 가진다. The present invention as described above, in response to the MBMS Radio Bearer Setup message for the MBMS RB setup required for the particular MBMS service in a mobile communication system providing an MBMS service of the wireless resources by not UE will not transmit the response message It has an effect which can double the efficiency. 또한, 이동통신시스템에서 응답 메시지로 인해 발생하던 시스템 성능 저하를 방지할 수 있는 효과를 가진다. In addition, it has the effect to avoid the system performance was caused by a response message in a mobile communication system. 상기 방송 서비스 제어정보에 의해 상기 수신하고자 하는 방송 서비스를 받는 과정을 포함함을 특징으로 하는 서비스 방법. By the broadcasting service control information services it characterized in that it comprises a process of receiving a broadcast service to be received above. 상기 방송 상태 메시지는, 미리 스케줄링된 주기에 의해 반복 전송됨을 특징으로 하는 서비스 방법. The broadcasting status message is a service characterized in that the repeatedly transmitted by the pre-scheduling period. 상기 미리 스케줄링된 주기는, 셀 방송 서비스를 통해 셀 별로 전송됨을 특징으로 하는 서비스 방법. Period of the pre-scheduling is, servicing characterized in that the transmission for each cell via the cell broadcast service. 상기 방송 상태 메시지는, 셀 방송 서비스를 이용하여 셀 별로 전송됨을 특징으로 하는 서비스 방법. The broadcasting status message is a service characterized in that the transmission for each cell using the cell broadcast service. 상기 제어정보의 요청은 메시지 타입과 단말 식별자 및 특정 패킷 데이터 서비스 식별자를 포함하는 무선 베어러 정보 재전송 메시지에 의해 이루어짐을 특징으로 하는 서비스 방법. Request of the service control information is characterized in a retransmission is left to the RB information message including the message type and the terminal identifier and a particular packet data service ID. 상기 방송 서비스 제어정보는, 상기 재전송을 요청한 단말만이 수신함을 특징으로 하는 서비스 방법. The broadcasting service control information, service method for a retransmission, characterized a receiving terminal only requested. 상기 방송 서비스 제어정보는, 상기 재전송을 요청한 단말을 구별하기 위한 무선망 임시 식별자를 포함함을 특징으로 하는 서비스 방법. The broadcasting service control information, service characterized in that it comprises a radio network temporary identifier for identifying a terminal requesting the retransmission. 서비스가 종료되는 방송 서비스는 상기 방송 상태 메시지로부터 제외시킴을 특징으로 하는 서비스 방법. Broadcast service which the service termination service method of claim Sikkim excluded from the broadcasting status message. 상기 재전송을 요청한 단말로부터 상기 방송 서비스 제어정보의 수신을 확인하는 과정을 포함함을 특징으로 하는 서비스 방법. Service method characterized in that it comprises the step of requesting a retransmission from the terminal acknowledges the reception of the broadcasting service control information. 상기 방송 상태 메시지는, 미리 스케줄링된 주기에 의해 반복 전송함을 특징으로 하는 서비스 방법. The broadcasting status message is a service characterized in that the repeatedly transmitted by the pre-scheduling period. 상기 미리 스케줄링된 주기는, 셀 방송 서비스를 통해 셀 별로 전송함을 특징으로 하는 서비스 방법. Service method according to the period of pre-scheduling, characterized in that the transmission for each cell via the cell broadcast service. 상기 방송 상태 메시지는, 셀 방송 서비스를 이용하여 셀 별로 전송함을 특징으로 하는 서비스 방법. The broadcasting status message is a service characterized in that the transmission for each cell using the cell broadcast service. 상기 제어정보의 전송 요청은 메시지 타입과 단말 식별자 및 특정 패킷 데이터 서비스 식별자를 포함하는 무선 베어러 정보 재전송 메시지에 의해 이루어짐을 특징으로 하는 서비스 방법. Service method characterized by the transmission request of the control information is made by the radio bearer information retransmission message including a message type and the terminal identifier and a particular packet data service ID. 상기 방송 서비스 제어정보는, 상기 재 전송을 요청한 단말만이 수신할 수 있도록 함을 특징으로 하는 서비스 방법. The broadcasting service control information, service characterized in that to the terminal only requests the re-transmission can be received. 상기 방송 서비스 제어정보는, 상기 재 전송을 요청한 단말을 구별하기 위한 무선망 임시 식별자를 포함함을 특징으로 하는 서비스 방법. The broadcasting service control information, service characterized in that it comprises a radio network temporary identifier for identifying a UE requesting the re-transmission. 상기 패킷 데이터 서비스가 종료할 때까지 미리 설정된 주기로 상기 정보들을 재전송하는 과정을 포함함을 특징으로 하는 서비스 방법. Period previously set until the packet data service is terminated service method characterized in that it comprises the step of retransmitting said information. 상기 호출 지시자는, 그룹 호출에 사용할 임시 멀티캐스트 그룹 식별자와 모니터링 주기와 관련된 불연속 수신 파라미터를 이용하여 계산된 호출 표시 채널의 위치에서 전송함을 특징으로 하는 서비스 방법. The call indicator, service characterized in that the transport from the location of the paging indicator channel calculated based on the discontinuous reception parameter associated with the temporary multicast group identifier and a monitoring cycle for the group call. 상기 호출정보는, 상기 호출 지시자에 대응하여 호출 채널을 통해 전송함을 특징으로 하는 서비스 방법. The call information, service characterized in that the transmission over the paging channel in response to the call indicator. 상기 무선 베어러 정보는, 복수의 단말들로의 그룹 전송이 가능한 순방향 접근 채널을 통해 전송함을 특징으로 하는 서비스 방법. The radio bearer information, services, characterized in that the transmission over a forward access channel capable of transmission to a group of a plurality of terminals. 상기 미리 설정된 주기는, 상기 정보들을 한번 전송되는 시간보다 크며, 상기 패킷 데이터 서비스가 지속되는 시간보다는 짧음을 특징으로 하는 서비스 방법. The predetermined period is greater than the time at which one transmits the information service method according to claim a short time than is the packet data service continues. 상기 무선 베어러 정보에 대응하여 응답 제어 메시지를 상기 무선망 제어부로 전송하지 않고, 상기 패킷 데이터 서비스에 대응하여 상기 무선망 제어부를 통해 전송되는 패킷 데이터를 수신하는 과정을 포함함을 특징으로 하는 서비스 방법. Instead of transmitting in response to the radio bearer information to the response control message to the radio network controller, the service method characterized in that it comprises the steps of: receiving packet data in response to the packet data service transmitted through the radio network controller . 상기 호출 지시자와 상기 호출정보 및 상기 무선 베어러 정보 중 어느 하나라도 수신하지 못한 단말을 위해 상기 패킷 데이터 서비스가 종료될 때까지 상기 호출 지시자와 상기 호출정보 및 상기 무선 베어러 정보가 미리 설정된 주기에 의해 반복 전송됨을 특징으로 하는 서비스 방법. Repeated by the paging indicator and the paging information, and the radio bearer information is a predetermined period until the packet data service ends for any of any failure to receive a terminal of the call indicator and the paging information and the RB information how to transfer services that feature. MX2007001408A (en) 2004-08-04 2007-04-16 Lg Electronics Inc Broadcast/multicast service system and method providing inter-network roaming.